A decaying fishing boat at Crow Point in North Devon. 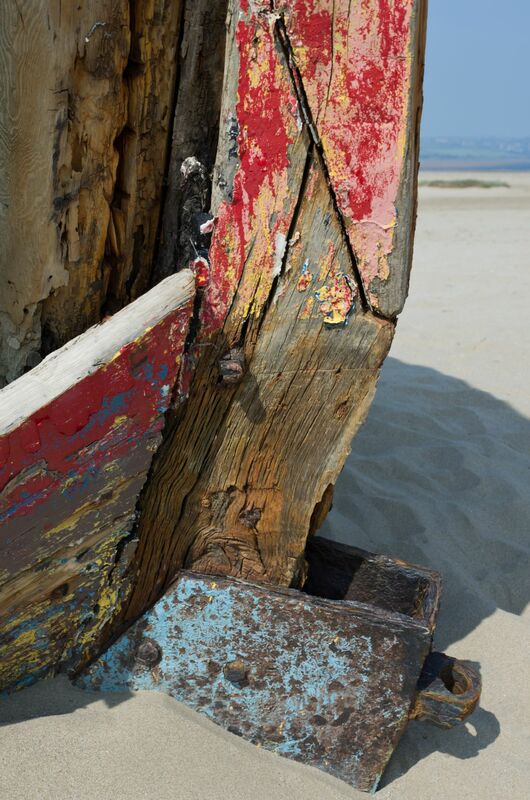 The fading colours,peeling paint and wood grain sucombing the passing of time on an abandoned boat in the sand of the Taw Estuary. 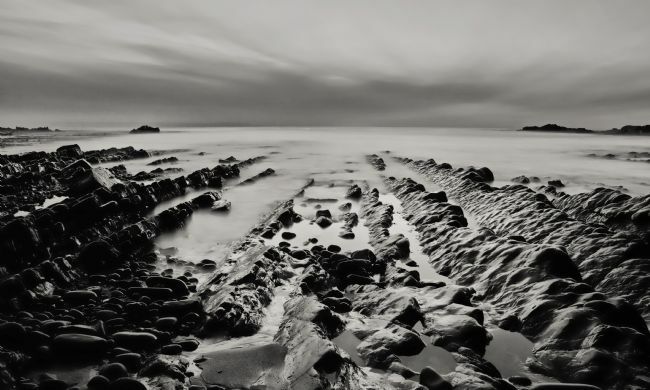 A long exposure image taken at dusk on Barricane Beach near Woolacombe and Mortehoe in N Devon looking towards Morte point. 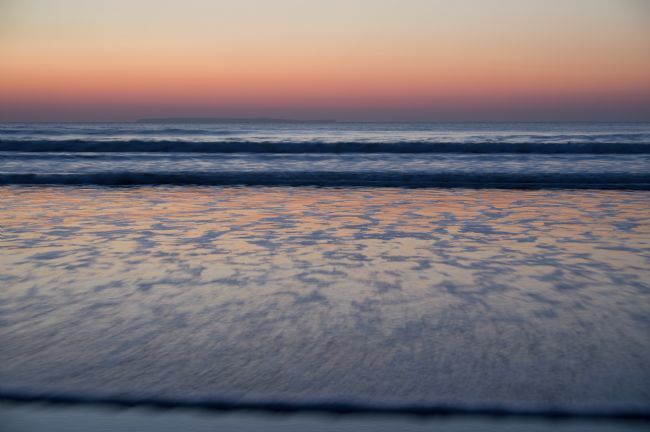 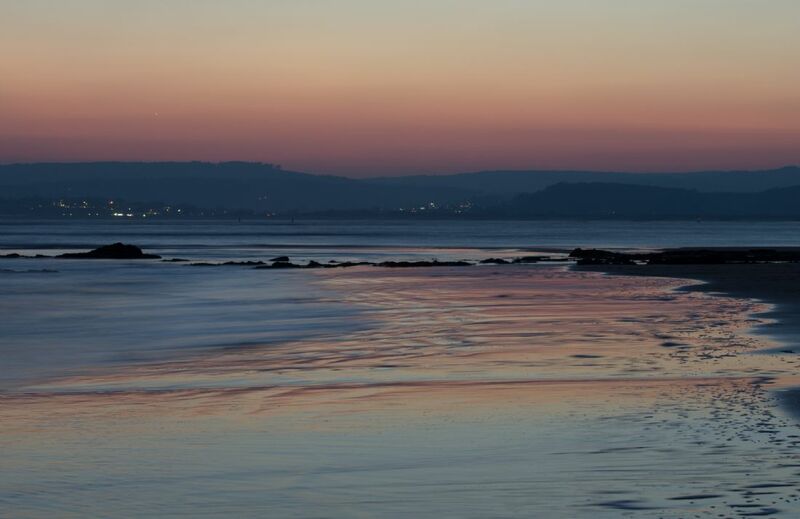 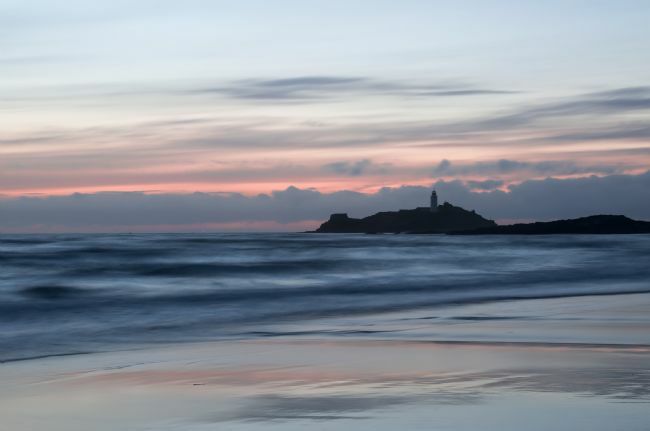 It was a January evening and an incoming tide with a gentle glow in the sky from the last colourful rays of the day reflecting colour on the sea surface. 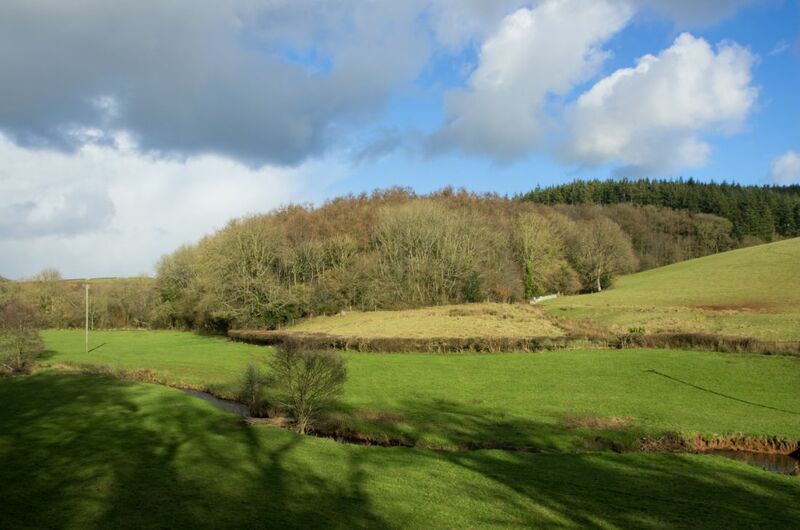 A small river in Devon near Bickleigh and Butterleigh called the Burn valley taken in winter sunlight with shadows, trees and lush green grass. 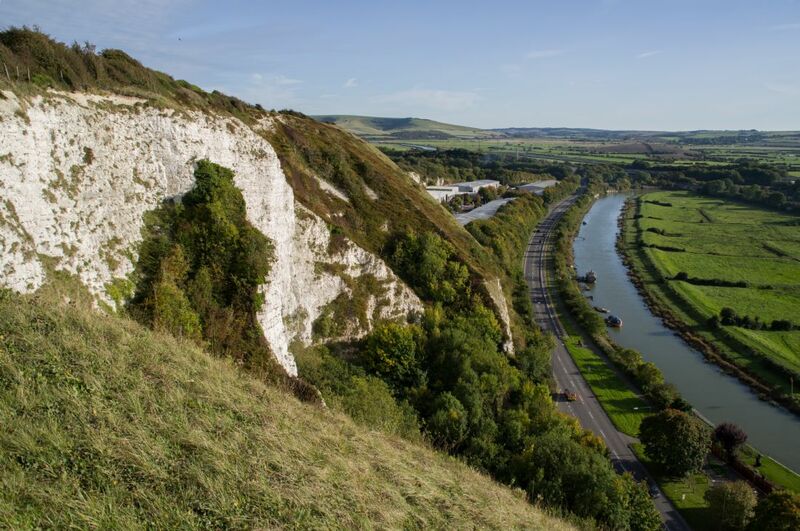 A view from the Cliffe Hill on the edge of Lewes with the River Ouse. A view point from the road to the Golf Course. 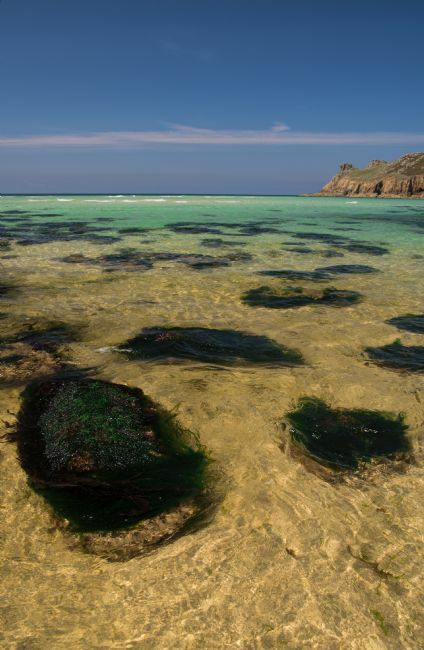 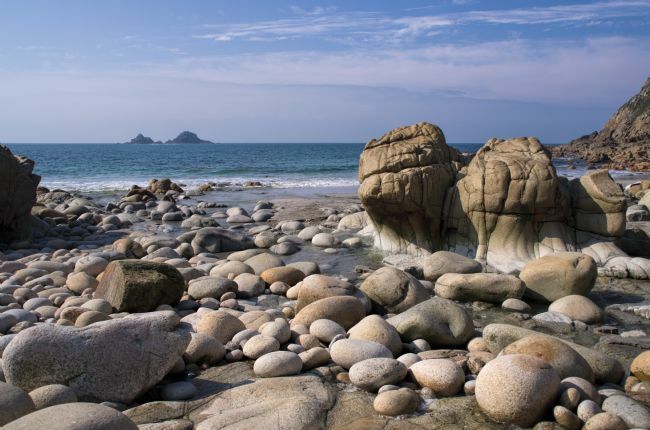 Low tide on a spring morning at Porth Nanven in far West Cornwall with the offshore rocky islets called the Brisons. 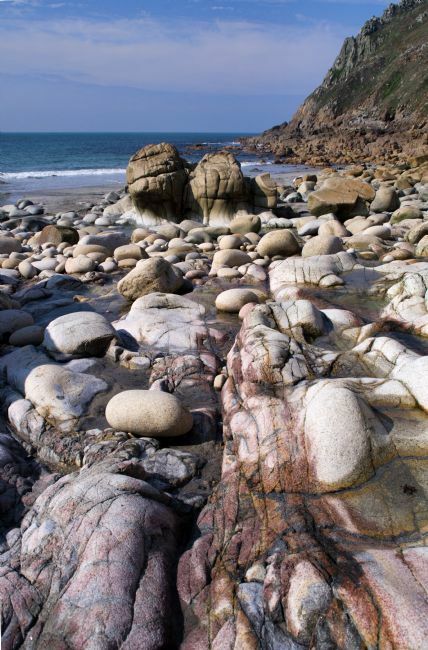 Porth Nanven the mouth of the Cot Valley is notable for the remarkable round stones. 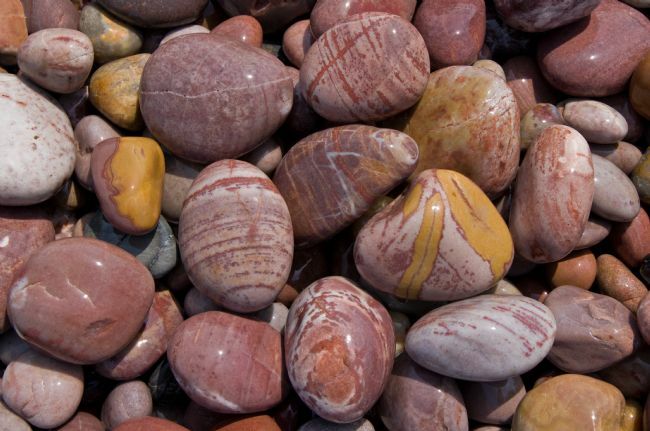 These stones from the the cliff behind the beach and are morraine deposits from the Ice age and now being released onto the beach by erosion. 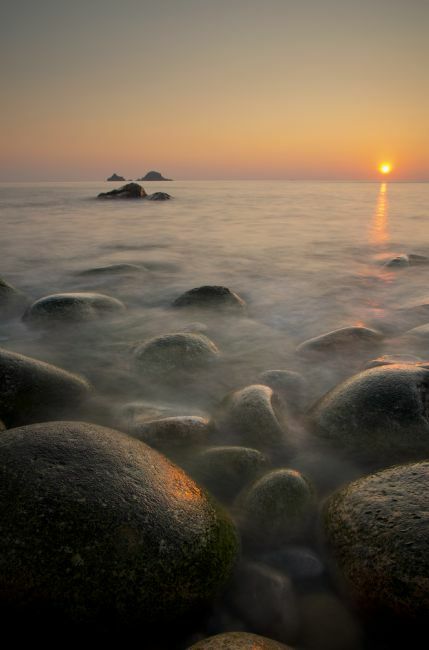 Low tide on a spring morning at Porth Nanven in far West Cornwall. Porth Nanven the mouth of the Cot Valley is notable for the remarkable round stones. 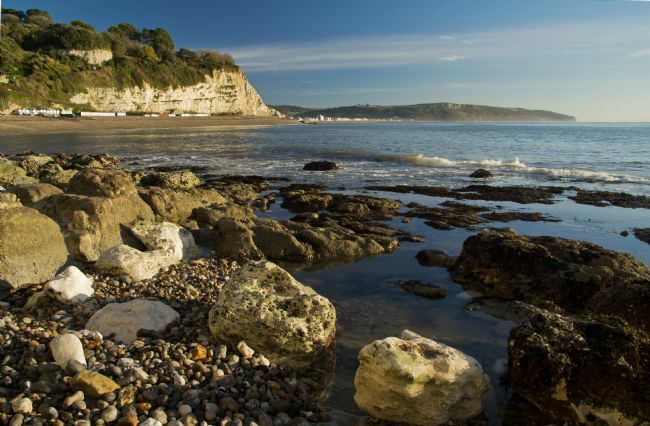 These stones from the the cliff behind the beach and are morraine deposits from the Ice age and now being released onto the beach by erosion. 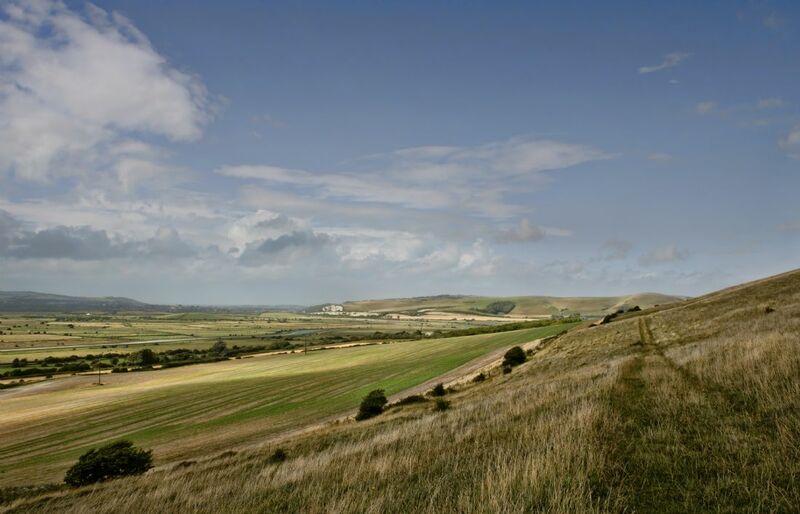 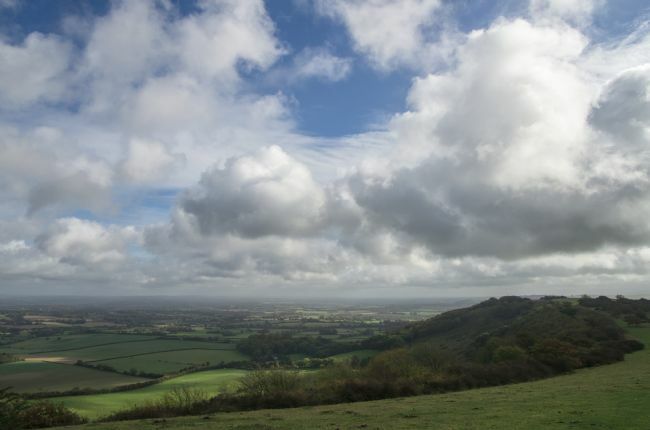 A view from Beddingham Hill near Firle Beacon towards Mount Caburn in Sussex. 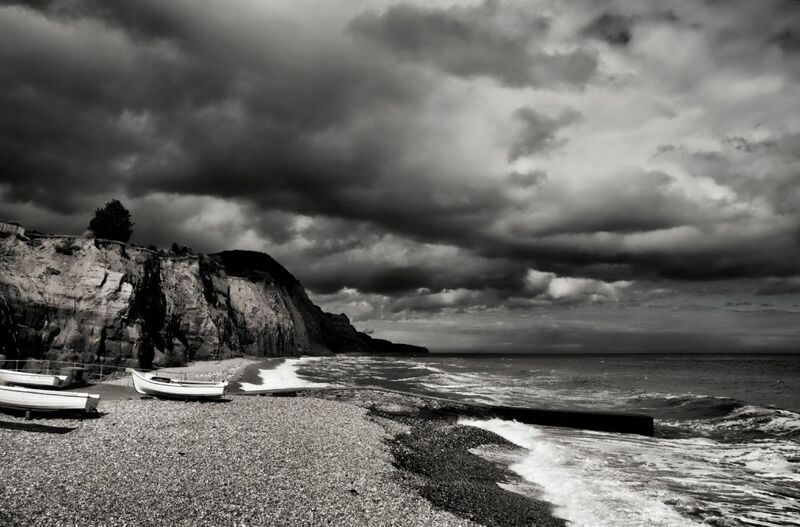 Dramatic clouds dwaf the landscape. In the distance the wind mill at Glyndebourne can be seen. A bright sunny day on the North coast of Devon at Broad near Hartland Quay. This V shaped rock structure is typical of the contorted strata of the area. 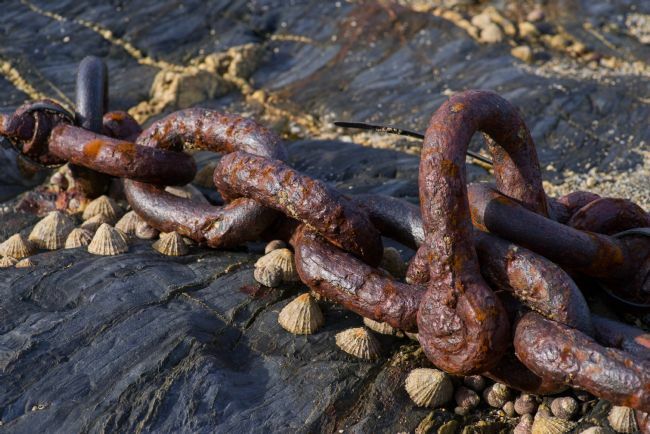 A detailed shot of a rusty chain in Gorran Haven in Cornwall. 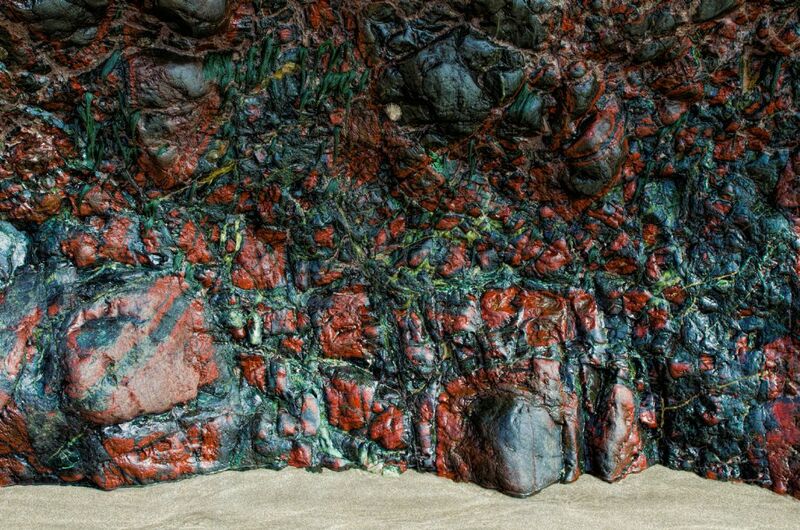 The rich rust colours and are contrasted against the barnacles and rocks in the afternoon sun. 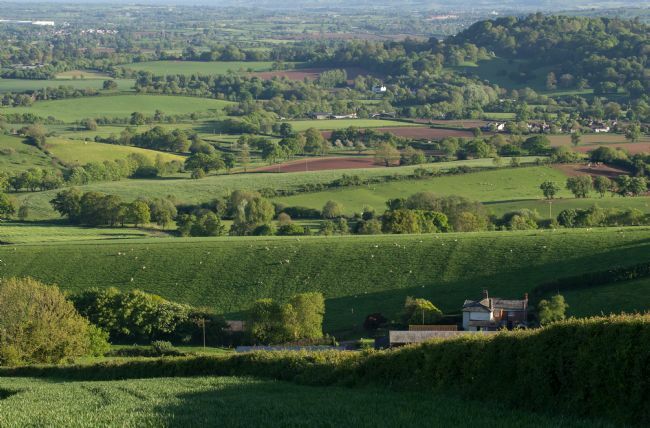 From the hills called Yarde Downs near the small town of Bradninch looking down over the lush green farmland in early summer with Woodbury Common in the distance. A bright sunny spring day at Constantine Bay in North Cornwall looking north to Trevose Head. 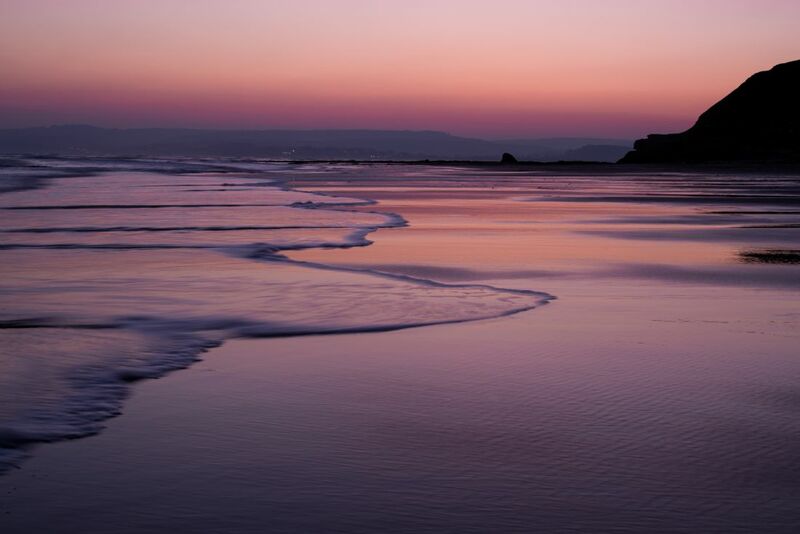 Beautiful colours and gentle surf at low tide show why this is such a wonderful place to visit. A sunny view late on a winters day, of the hills between Cullomton and Bradninch. 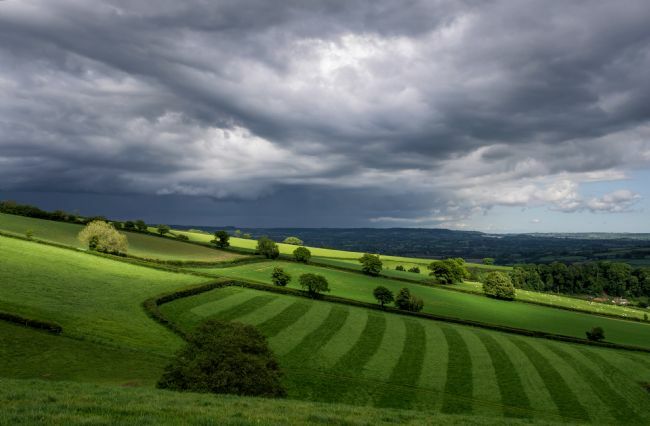 With rich green grass and long shadows and active clouds. 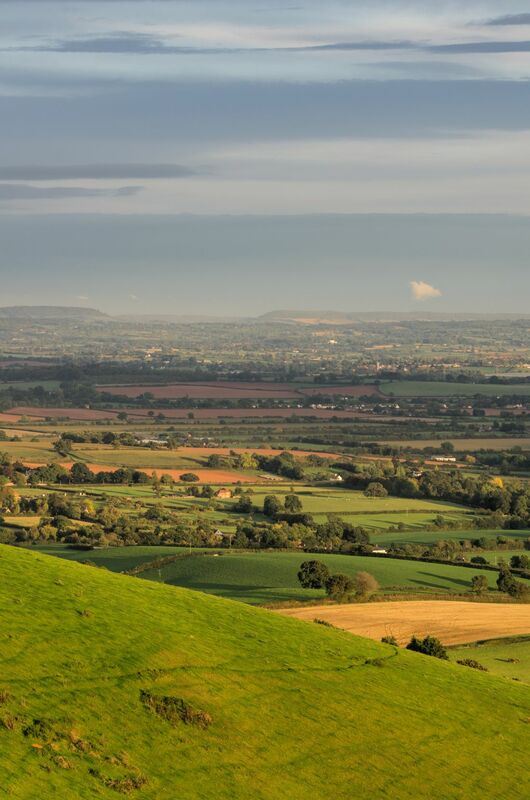 SIdmouth Gap in the distance from Raddon Top in Mid Devon. Glancing sunlight on the colourful fields of Mid Devon looking a long way south. With high clouds on a September evening. A sunny view late on a winters day, of the hills between Cullompton and Bradninch. With rich green grass, long shadows and active clouds. A misty winters morning over Hele Payne farm in Mid Devon near Bradninch. 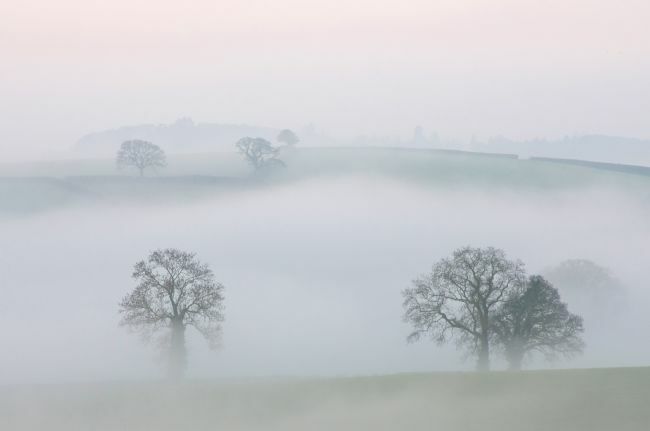 The trees and hills peeping up through the mist from the Culm valley. A view of Porllock Bay towards Bossington and Hurlstone Point from Porlock Weir. 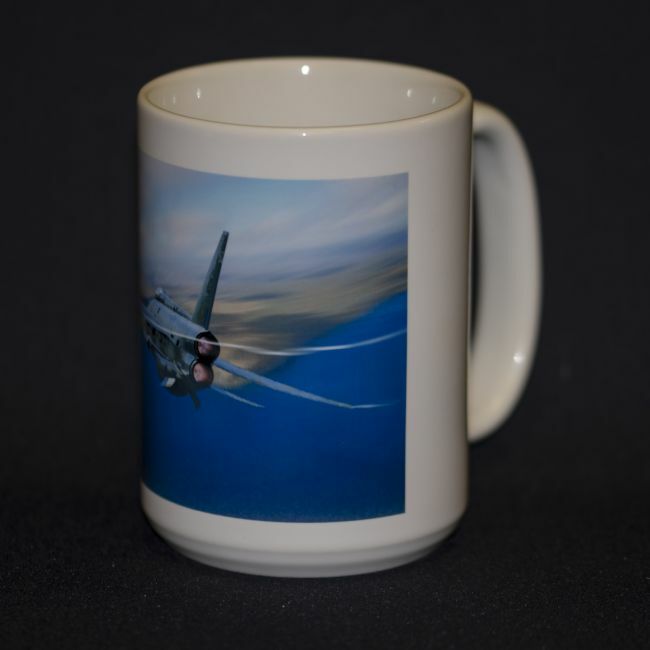 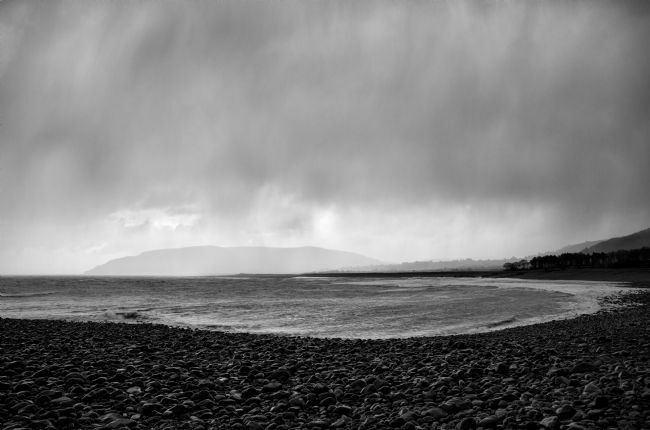 Taken on a cold winters morning with a fierce wind blowing and rain over the sea. 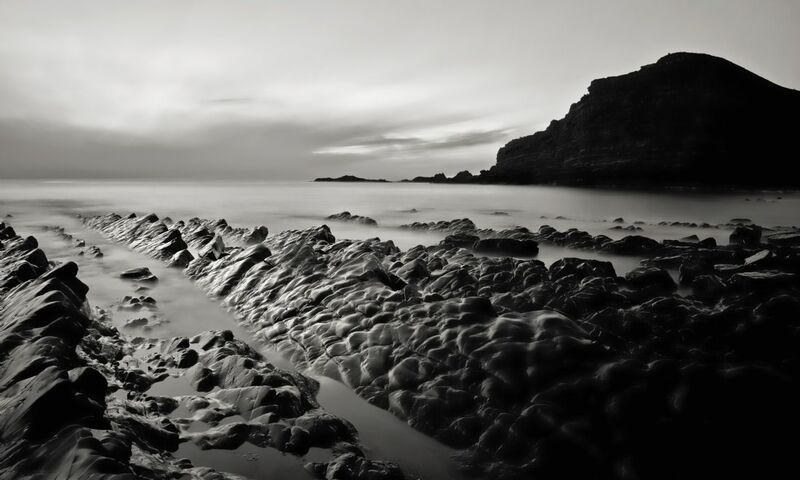 Rendered in monotone. 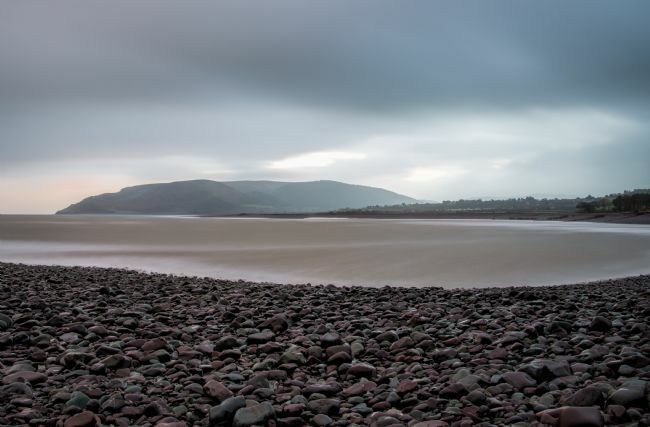 A view of Porlock Weir towards Bossington and Hurlstone Point taken early morning on a cold and stormy winters day. 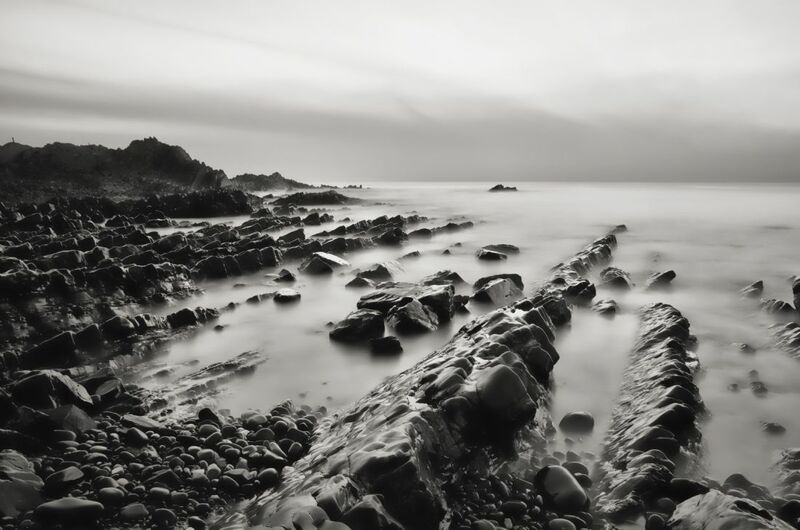 A long exposure with fast moving clouds and smoothed out sea. The colours of the large pebbles enhanced by the wet from the rain. Winters sunrise over Haytor on Dartmoor with ice and snow. A very cold January day but one the lifts the spirits. 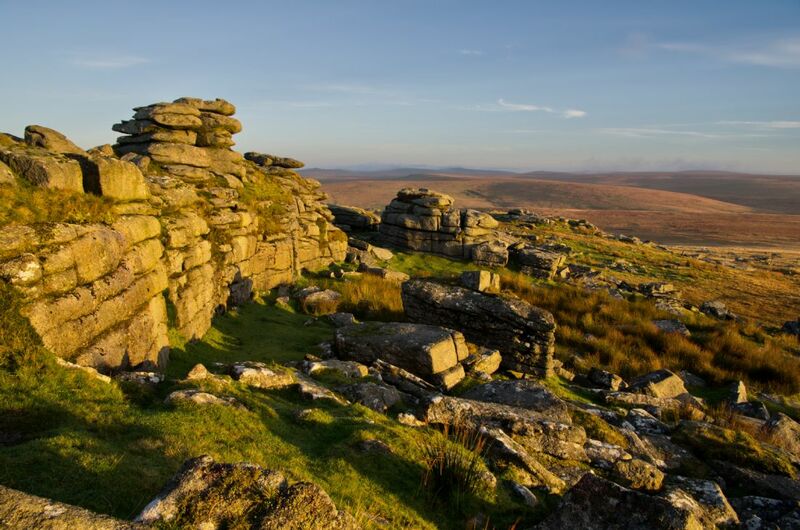 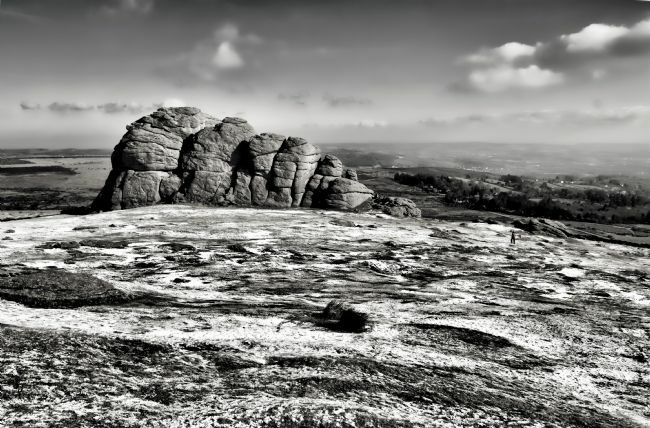 Haytor is the most popular Tor on Dartmoor but on mornings like this you have the whole place to yourself. 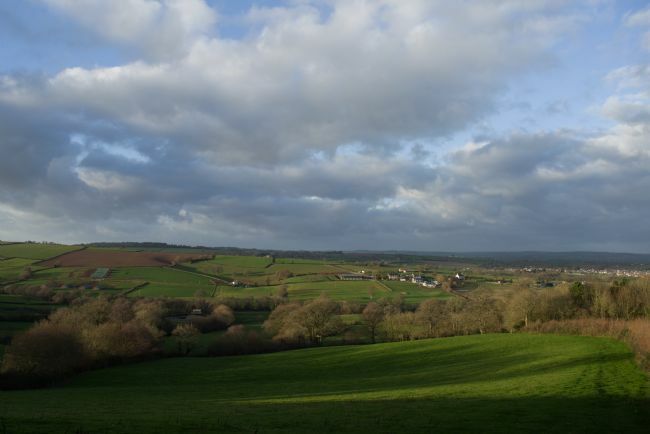 From the road near Westwood towards Ashclyst Forest in Mid Devon on a sunny winters day. 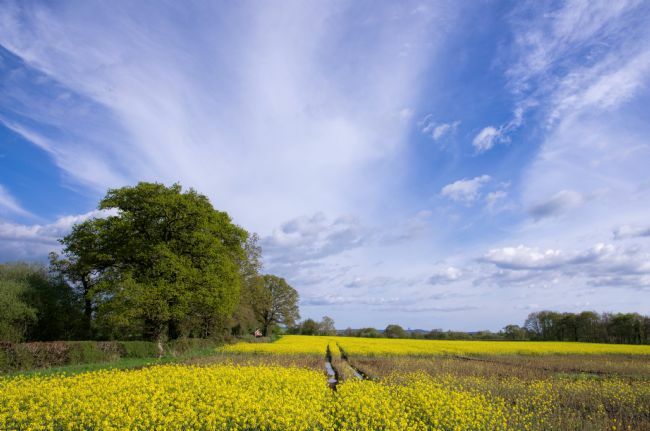 Fields stretching out below Yarde Downs towards Killerton in Mid Devon. 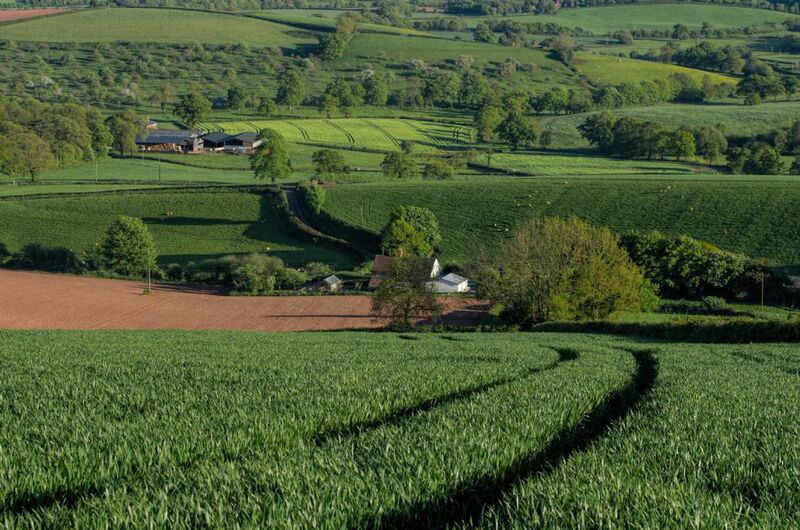 Lush greens and red soil in the fields brought to life with long slanting liight from the low angled sun. 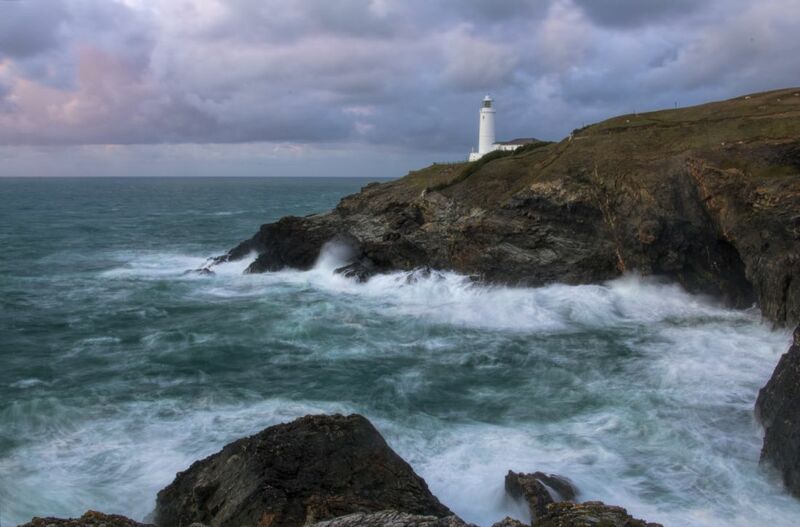 Trevose Light house in North Cornwall near Padstow. 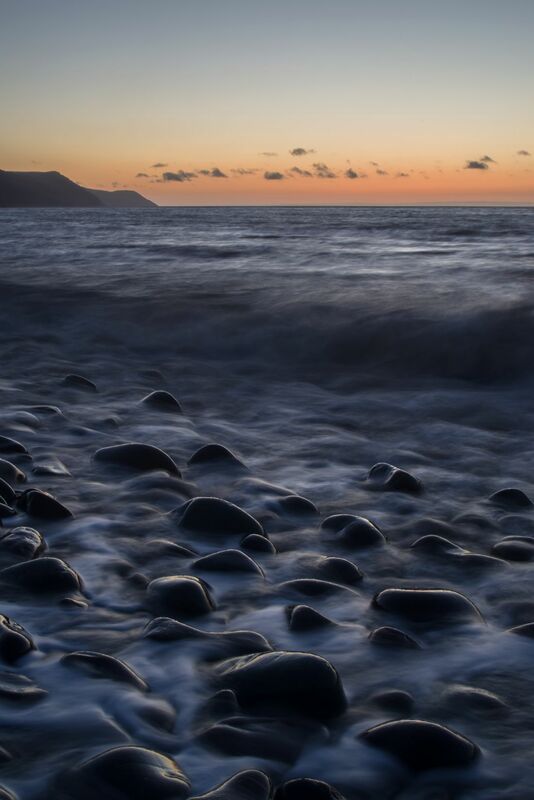 Taken on a breezy September day at dusk and a long exposure to give the waves a sense of movement. 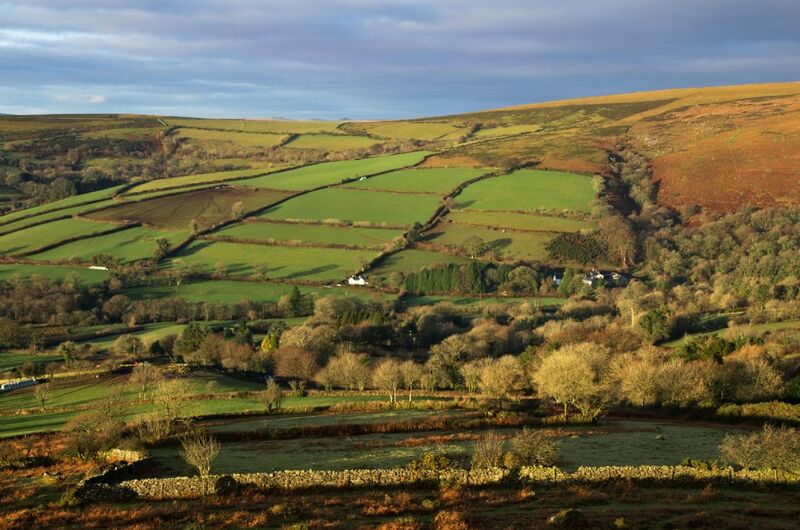 A view point from Bell Tor rocks Bonehill downs towards the Widecombe area and Hameldown over the valley of the small West Webburn River. Taken in the morning on a sunny January day. 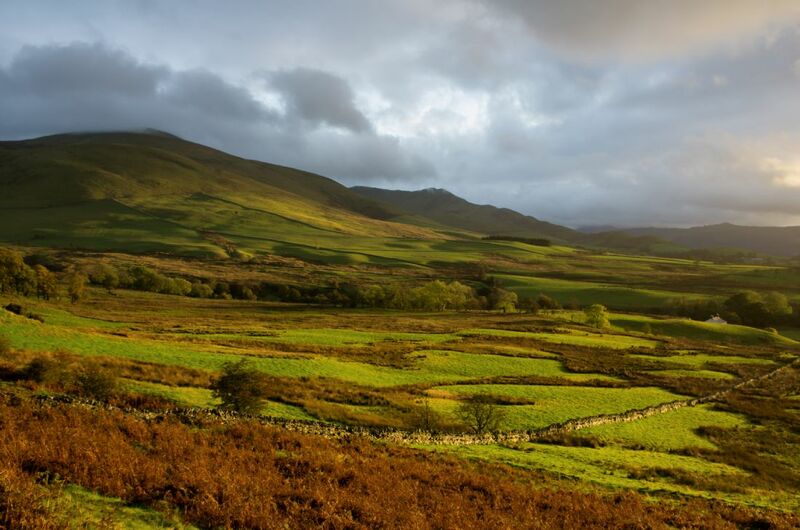 This shows the tapestry of fields giving way to the upland moor areas covered last years bracken. 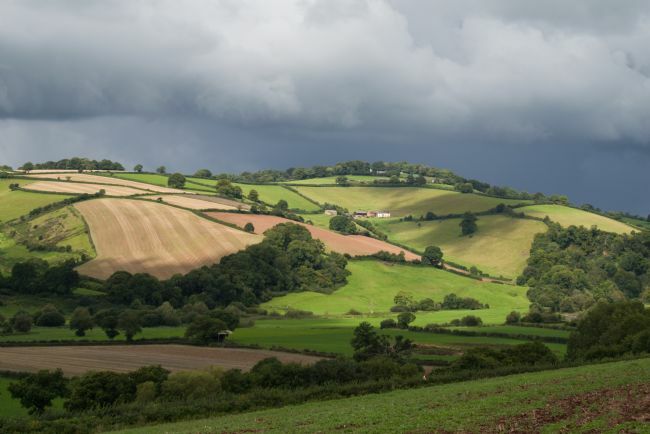 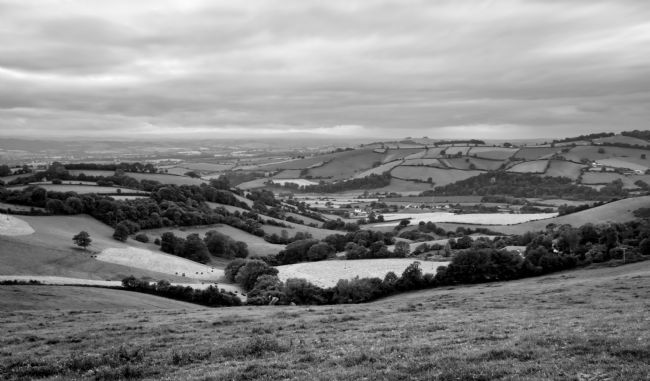 The Culm valley near Bradninch in Mid Devon. 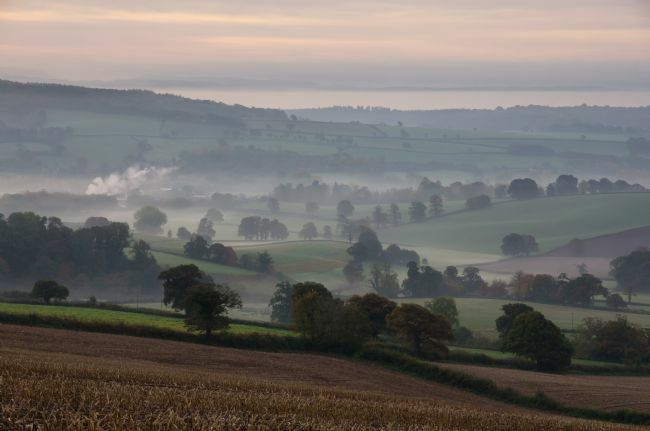 Early morning in late Autumn, mist lingers in the valley with a pattern of fields on the Dunchy farmland and Hele paper Mill. 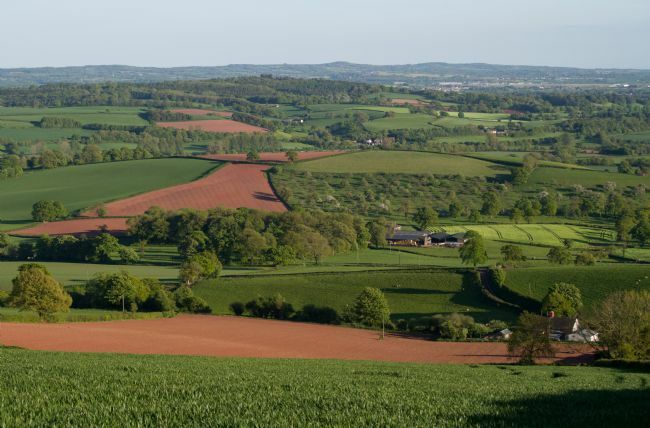 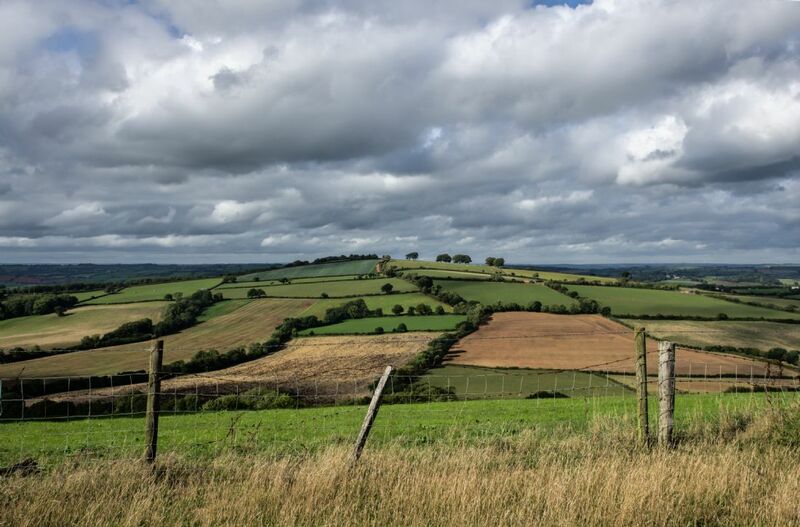 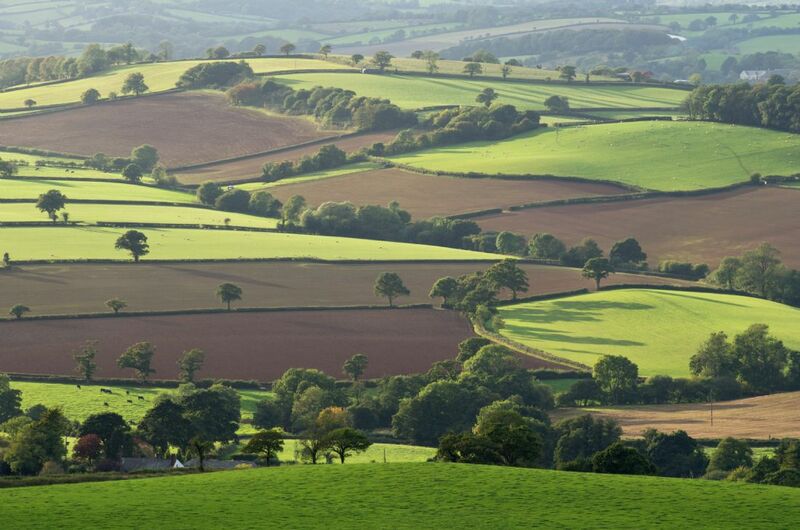 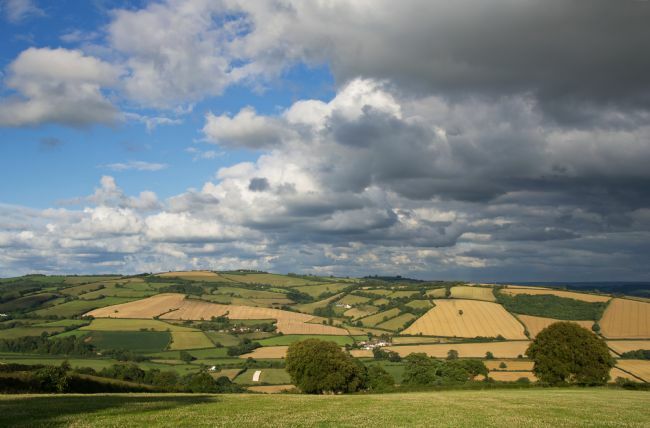 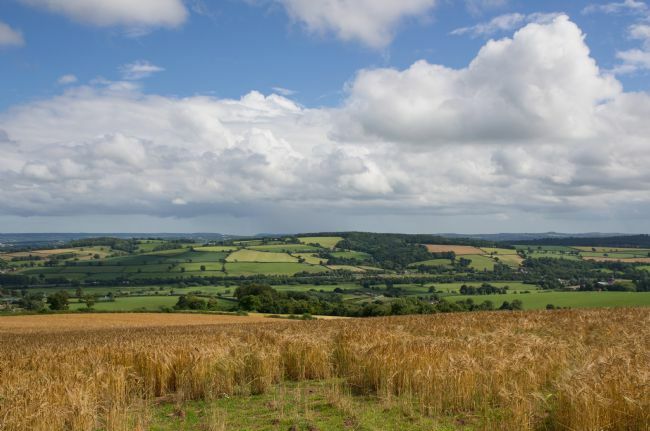 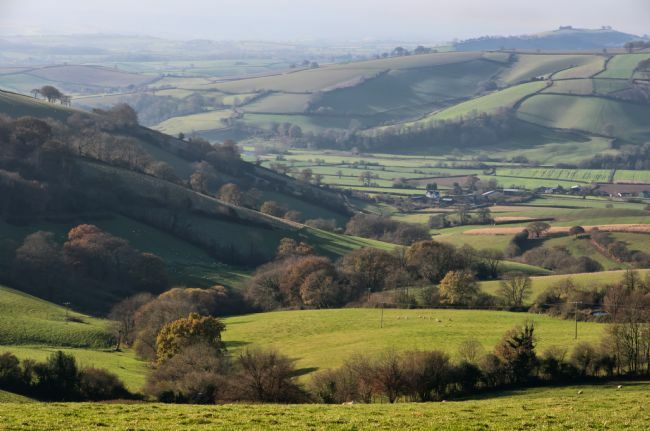 Looking down from the hills of Mid Devon near Bradninch over Caseberry and Moorland Farm in the spring with beautiful farmland and crops in verdant fields. 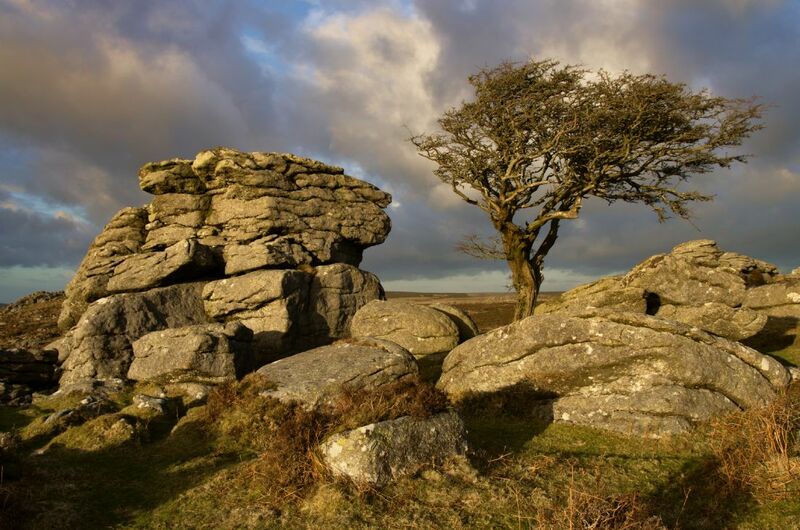 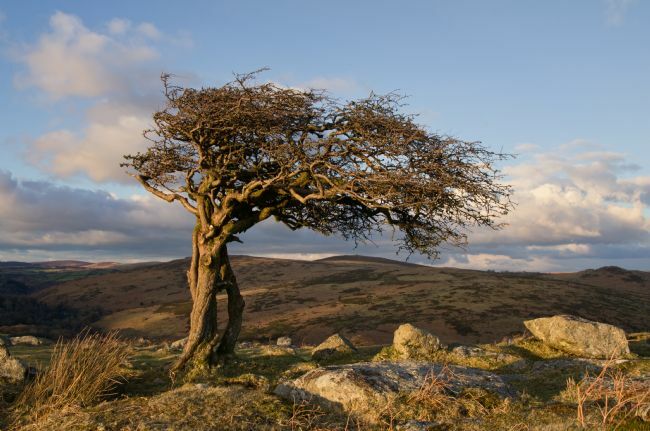 The beauty of a lone tree and a granite Tor next to each other on a Dartmoor slope with late summer light bursting through at a low angle and bright clouds as a backdrop. Low light grazing the field while the sheep are also grazing the grass in this farmland scene from Devon near Bradninch. 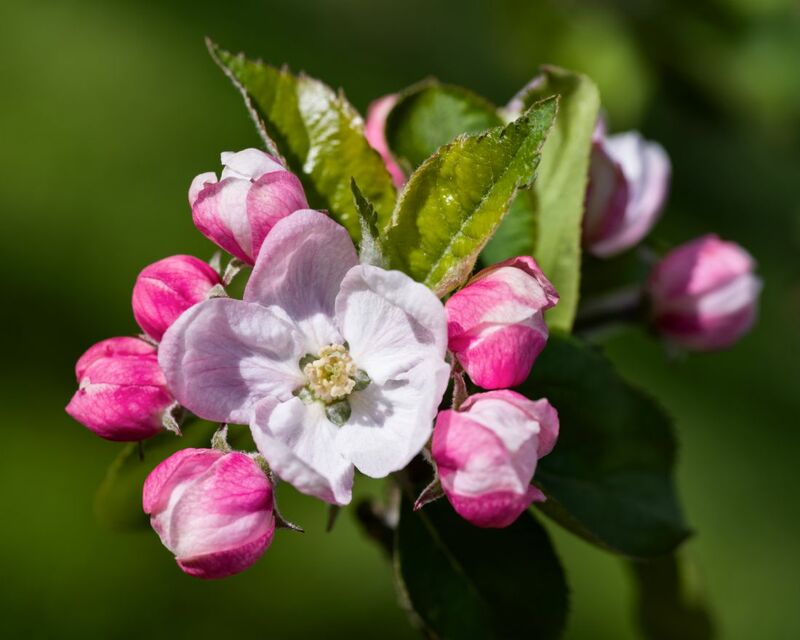 Hele Payne is a delightful well cared farm amongst Duchy land and looking specially good this year after good rains and sun to promote growing. 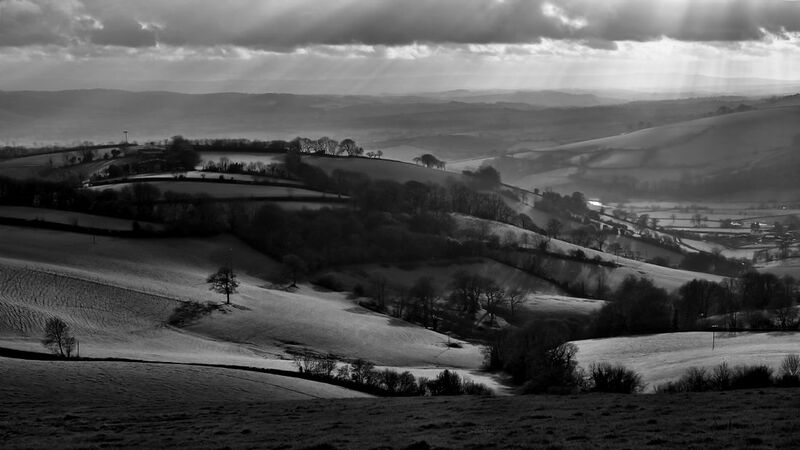 A view from the hills near Silverton over the Exe valley taken on a December day with low sun casting long shadows over the curves of the rolling hills and fields. This is a special part of the Exe valley where the river emerges from the last of the hills into a flat plain before reaching Exeter. 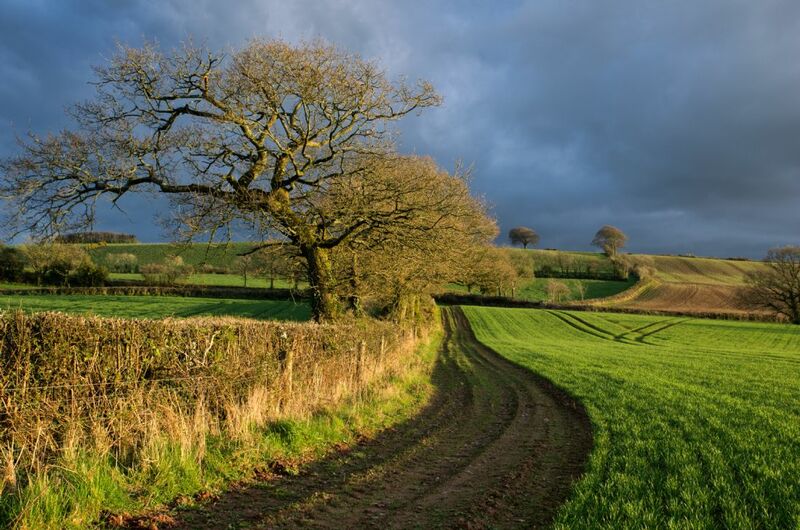 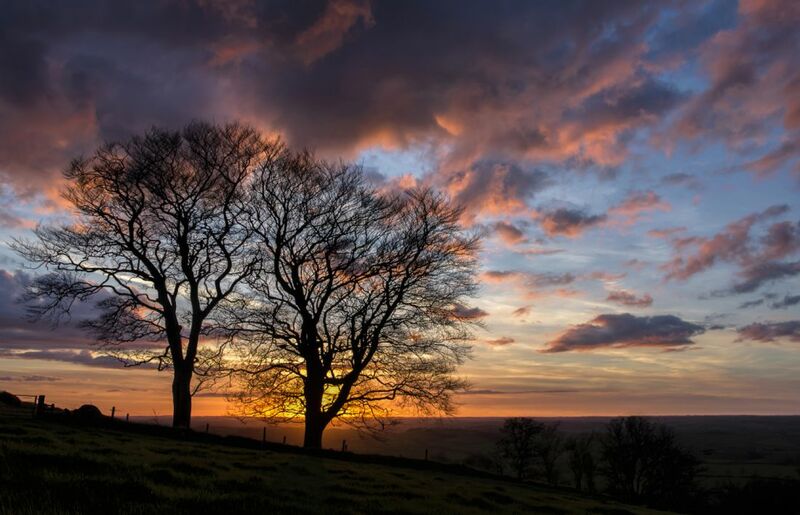 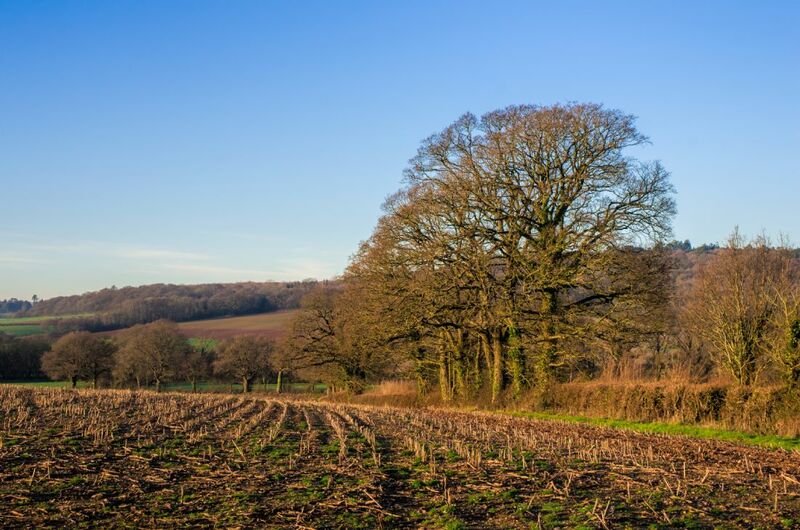 This shows the intricate field systems typical of Devon and also trees clinging to the last of the leaves in what has been a long and beautiful Autumn. 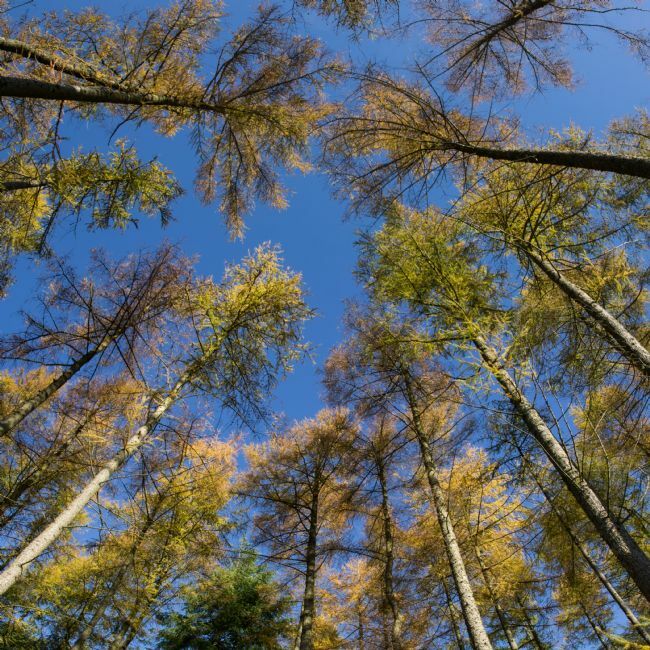 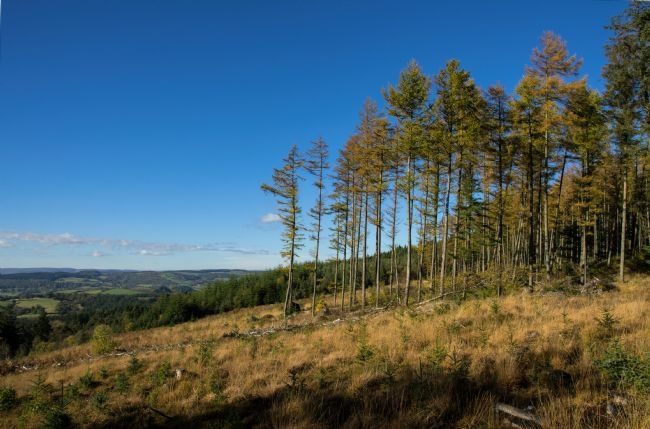 An autumal view of tall fir trees in Haldon woods near Exeter. Catching the lovely yellows on a bright clear day. 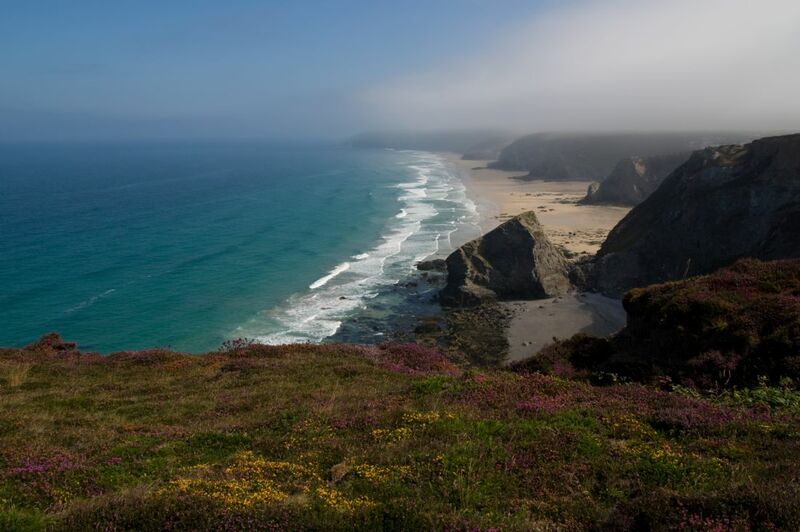 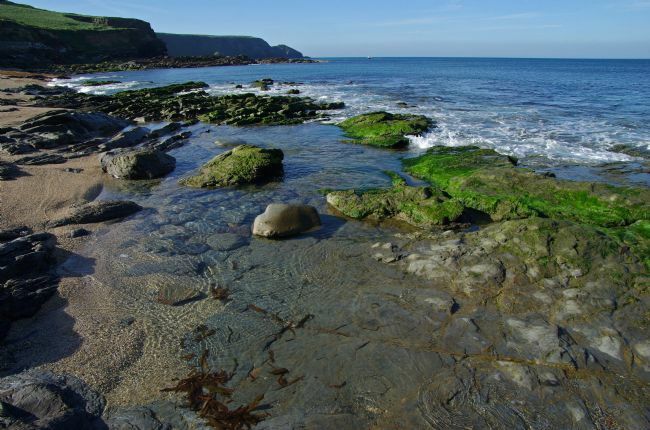 The south Cornish coast has a long beach with Porthleven at one end and Gunwalloe at the other. 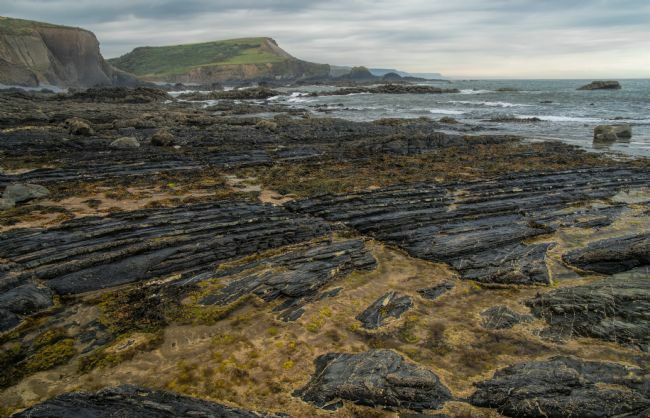 This is taken at low tide in May on a gentle day showing rock pools and rippled water. Part of the SW Coastal Path. A clapper bridge called Tarr Steps on the River Barle in Somerset. A popular place for walking and picnics. 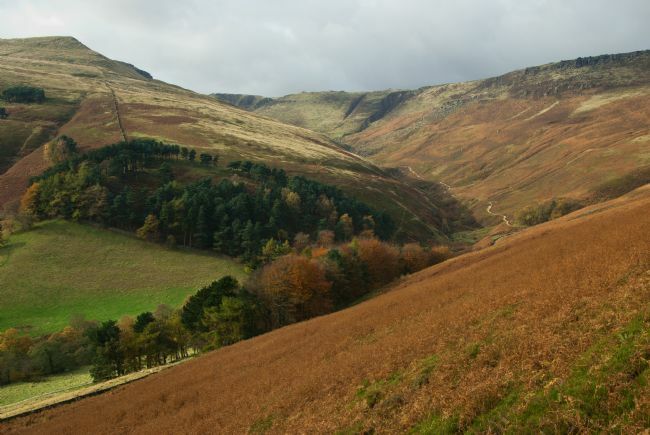 Seen here with glorious autumnal colours. 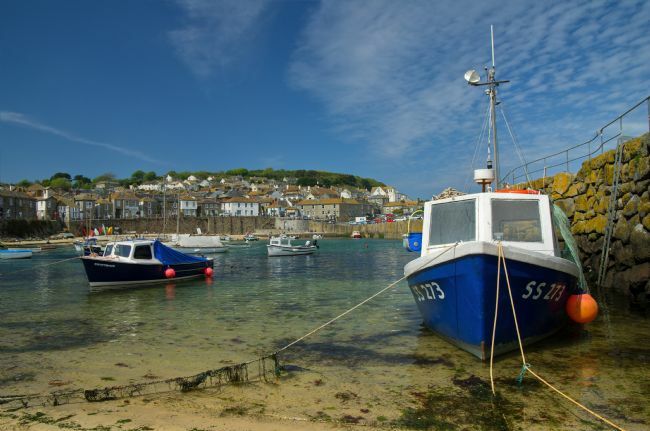 The popular harbour of Mousehole taken on a sunny day at mid tide, with a light cloud covering in May. 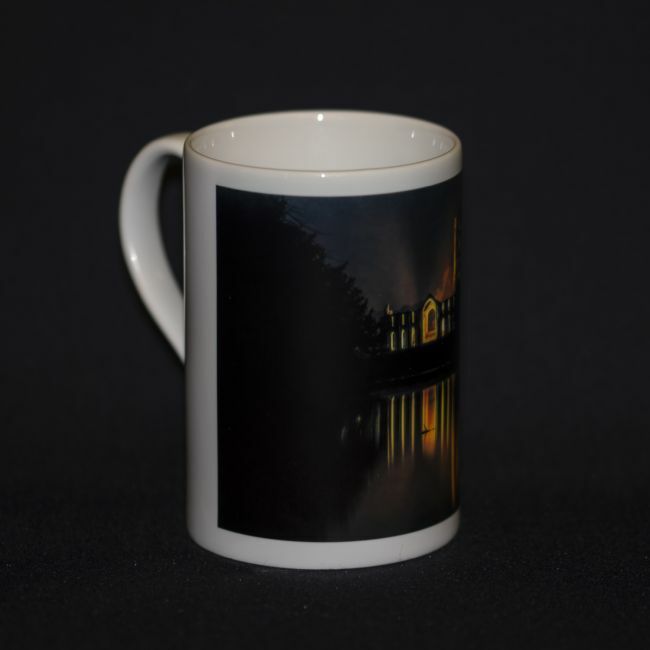 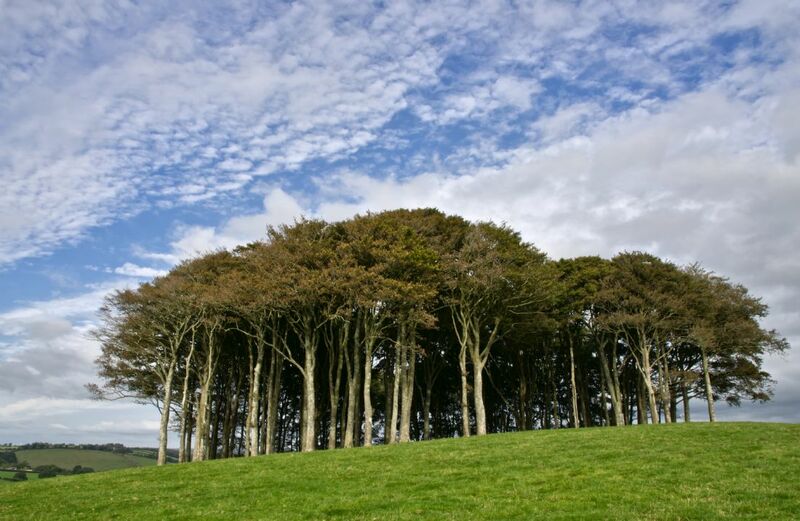 This is a popular place in West Cornwall to relax and soak the atmosphere. The is a light mackerel sky to indicate the good weather. 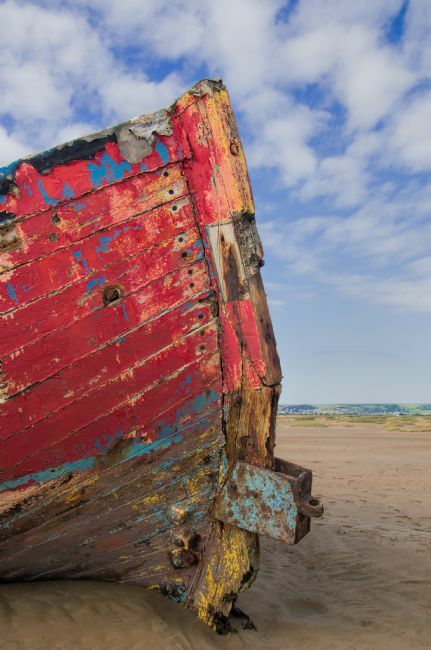 An old rusty wreck and ruin waiting for restoration. 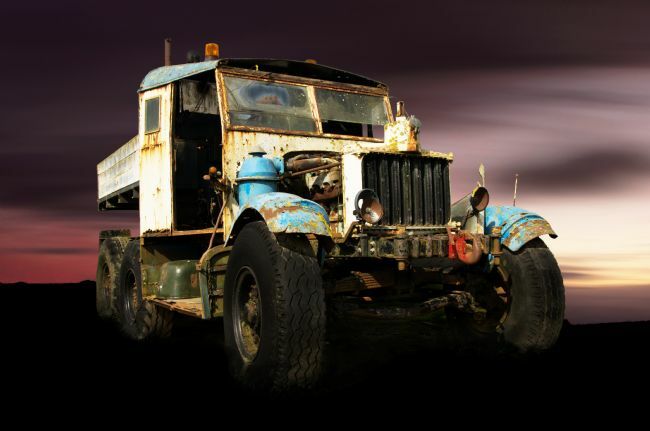 A Comma truck in need of TLC. Depicted here with a suitable dark brooding background. 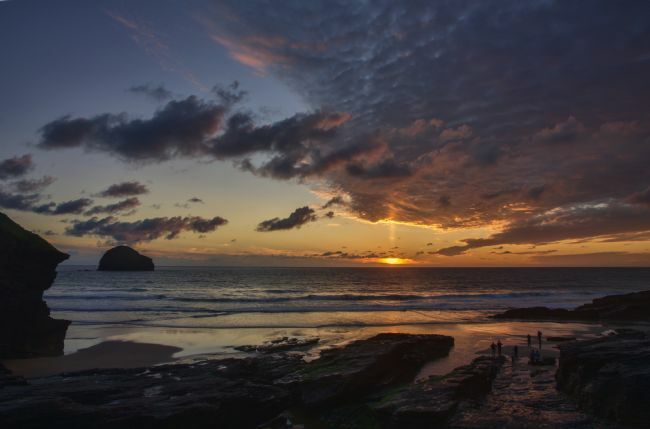 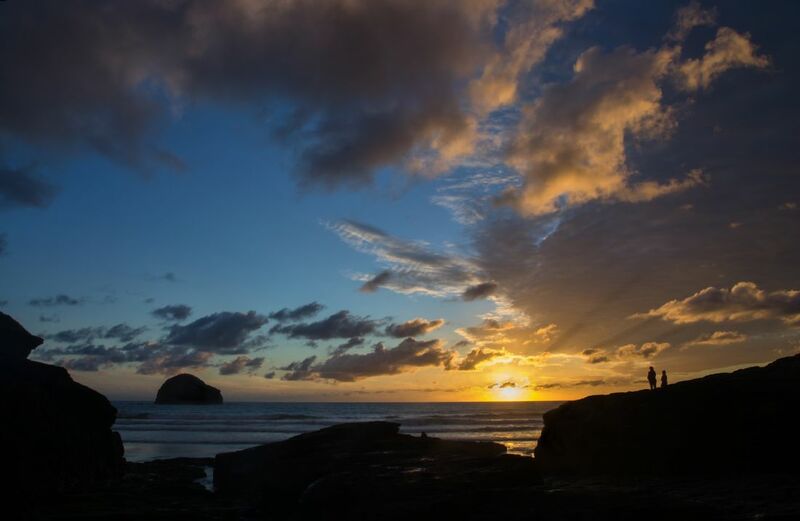 An evening shot of Trebarwith Strand and the small island of Gull Rock on the North Cornish Coast. The beach with the out going tide was bathed in glorious light and dramatic clouds as the sun appeared briefly at the end of an overcast day. A sprinkling of snow on Haytor in Dartmoor, taken one cold February day. Looking east towards the Haldon Hills in the distance and a lone figure giving the scale. Rendered in Black and White. 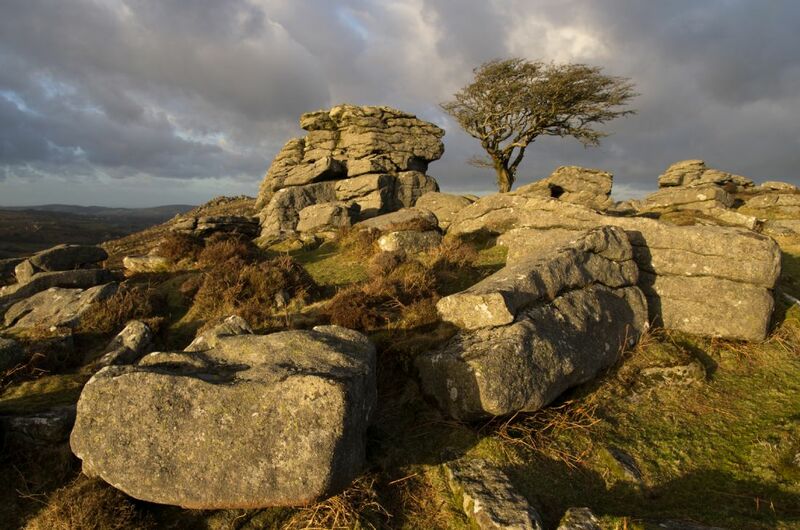 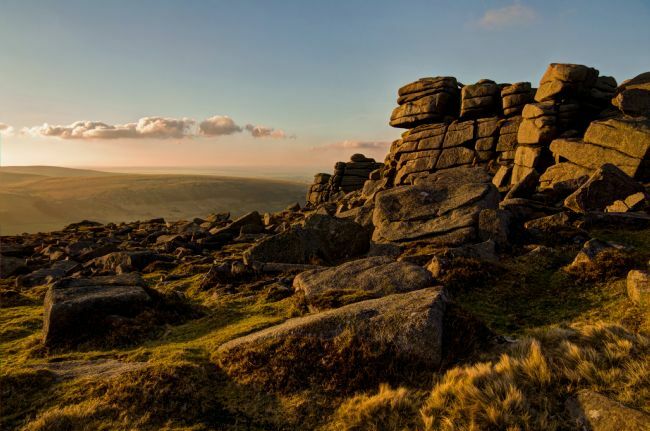 The late afternoon winter sun bathing Higher Tor on the Northern edge of Dartmoor near Belstone. 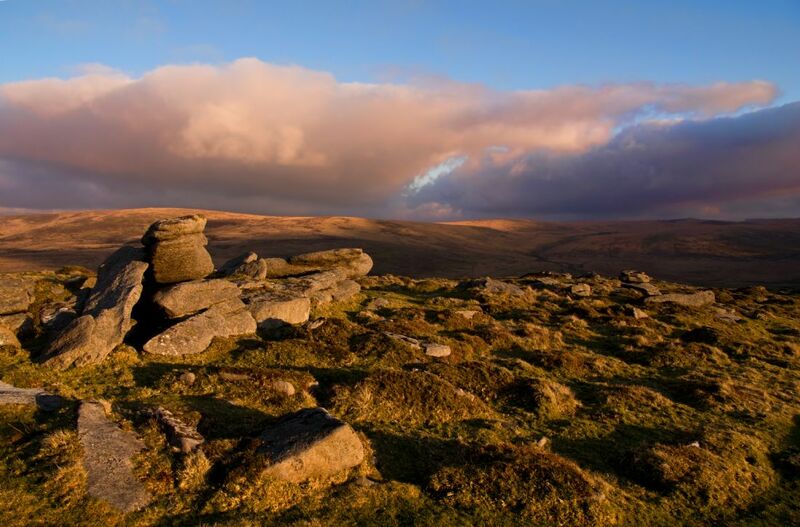 Late evening light on Northern Dartmoor in February near Belstone and Higher Tor, the low sun making the clouds pink and casting shadows in the rocks and tuffty grass. 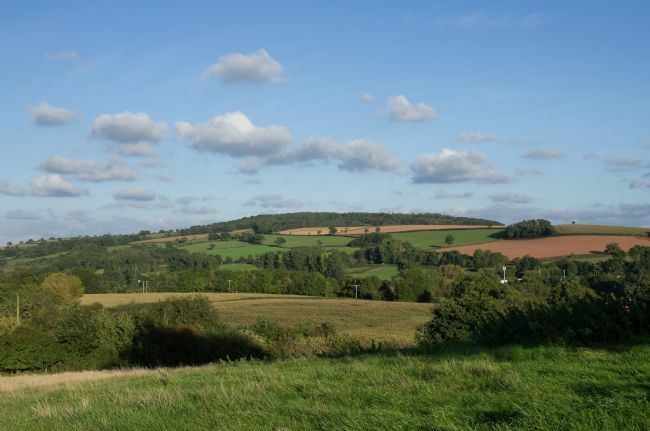 This is near the Village of Belstone. A summer scene over the Culm valley in Mid Devon taken in summer time. With the Barley nearly ready to harvest and the green of Paradise Copse and Ashclyst Forest over the valley. 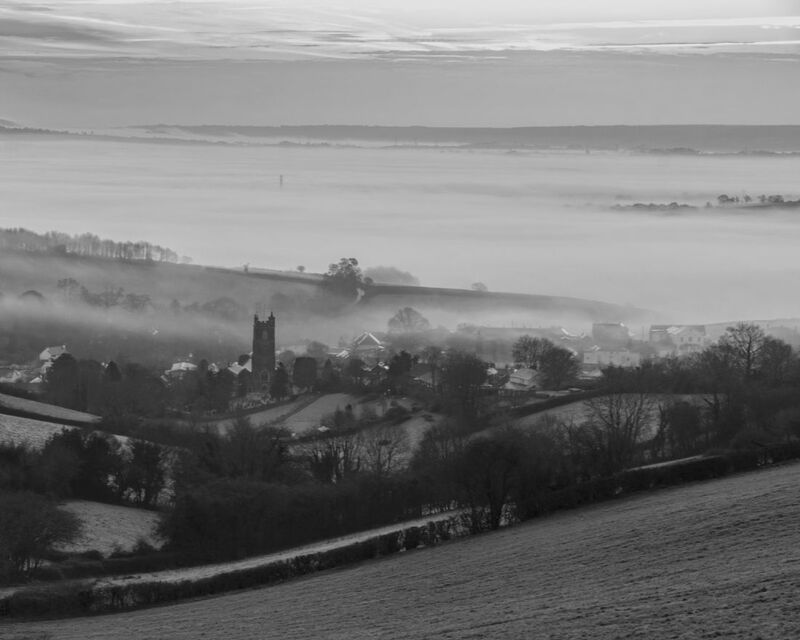 Bradninch hidden by the slope of the hill. 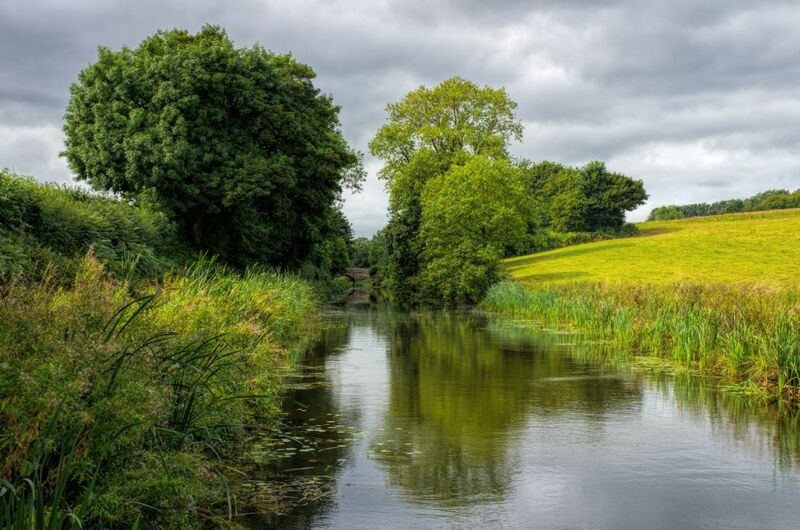 The Horse Drawn barge on the Grand Western Canal at Tiverton. 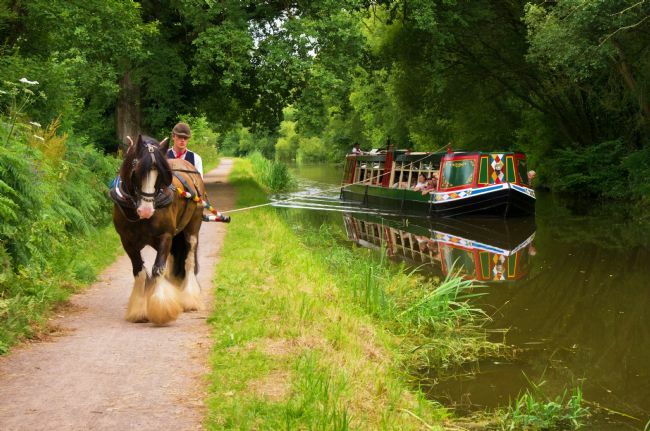 The fine cart horse pulls the gaily painted barge up and down the canal for pleasure rides. 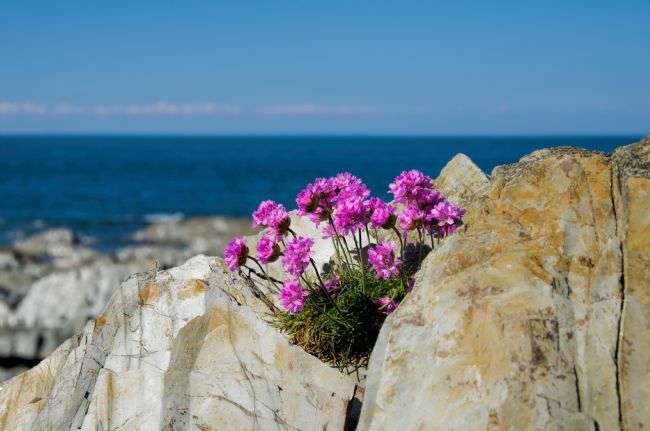 Seen here on a sunny summer day. 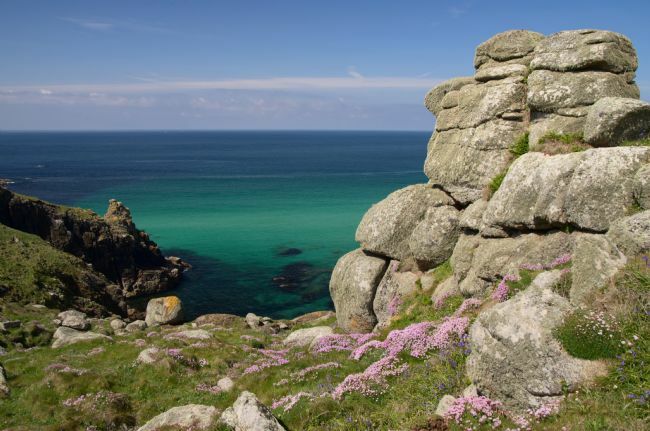 Thrift and moss on the rocks in a spring shot of the Cornish coast at Pendower Cove in the Penwith area. Looking out over the shallow azure sea towards the blue horizon. 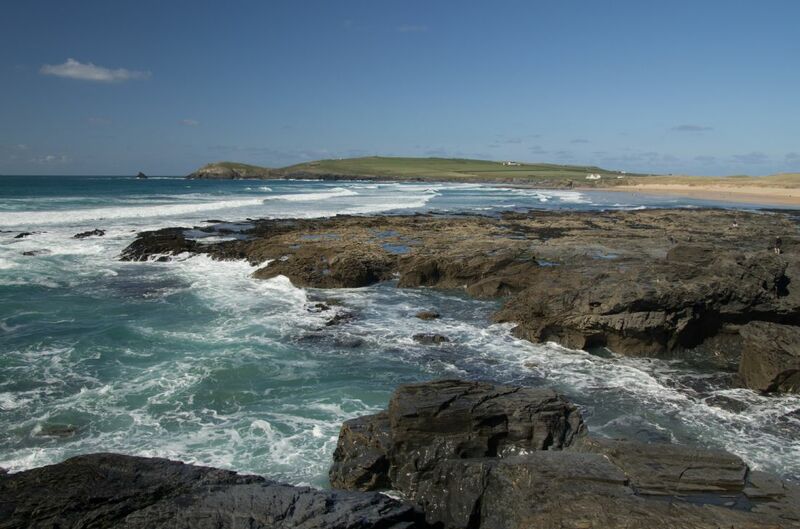 This is taken from part of the coastal path on a day in May. 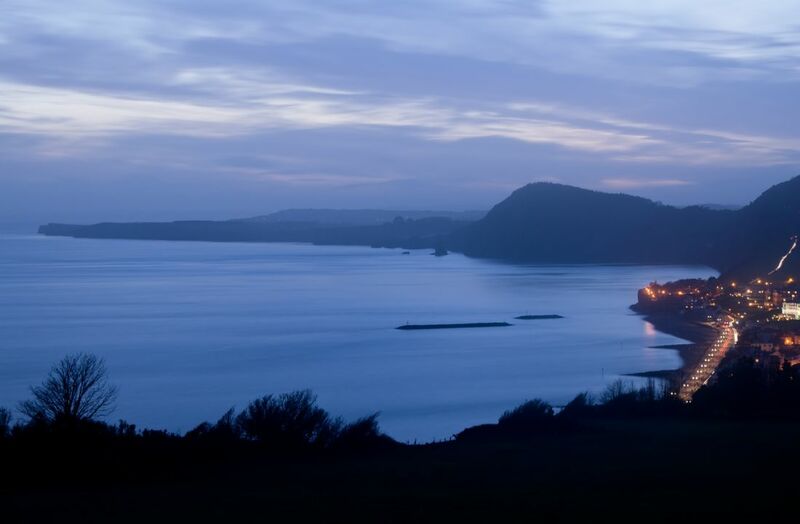 Spekes Mill in North Devon taken after sunset, showing the out going tide revealing dark shiny rock formations reaching out to sea. 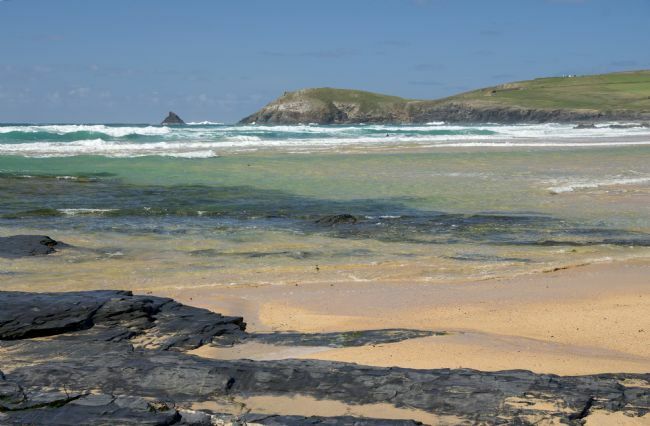 A beach that is difficult to traverse in the near darkness and access to the beach is aided by a large fixed rope. 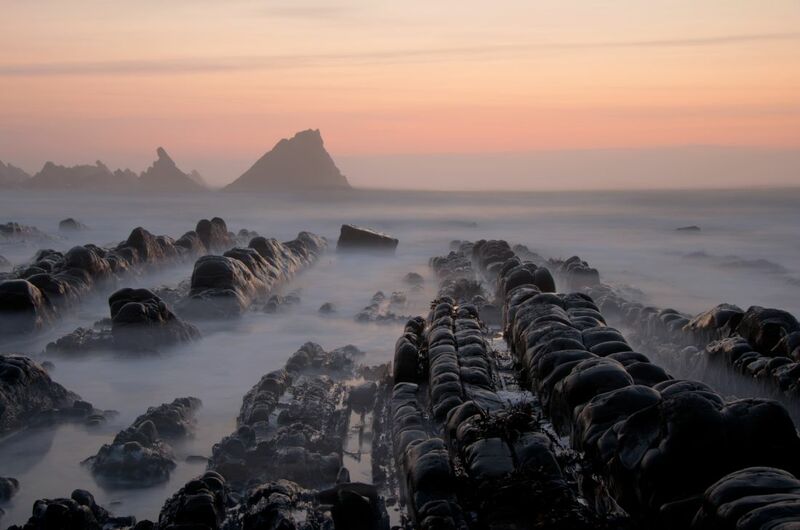 A beach near Hartland just south of Screda cove by Spekes Mill in North Devon taken after sunset, showing the out going tide revealing dark shiny rock formations reaching out to sea. 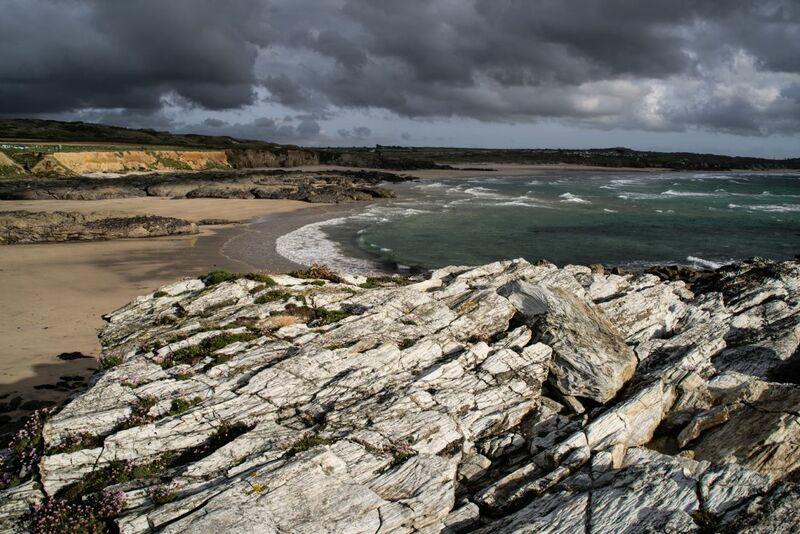 A beach that is difficult to traverse in the near darkness and access to the beach is aided by a large fixed rope. 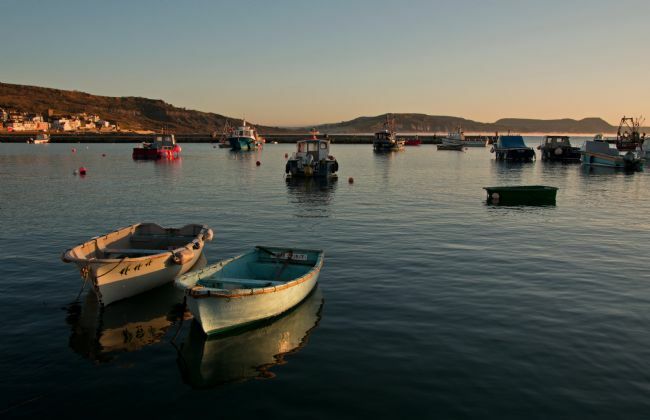 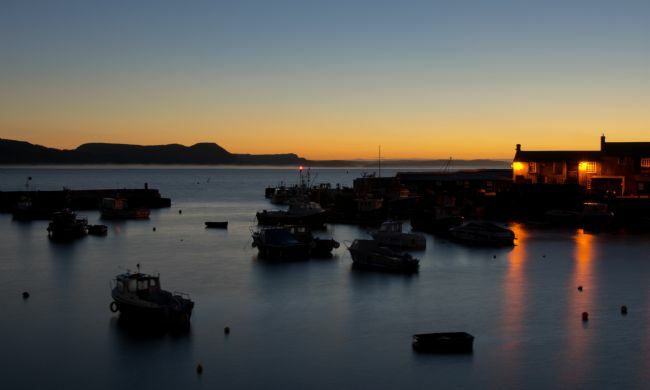 The harbour at Lyme Regis, before sunrise with the boats resting on a high tide. 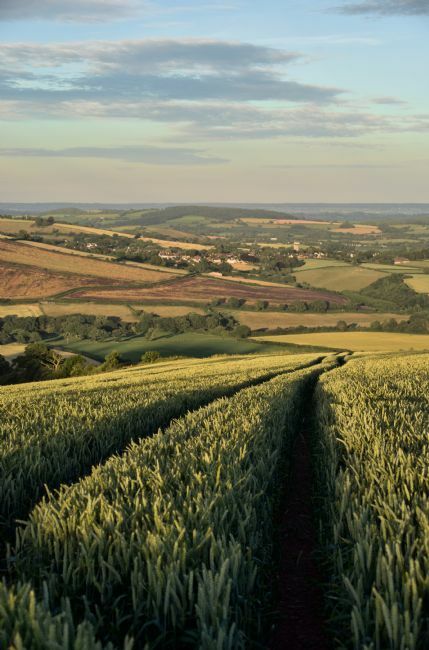 The distant hill is Golden Cap the highest point in Dorset. 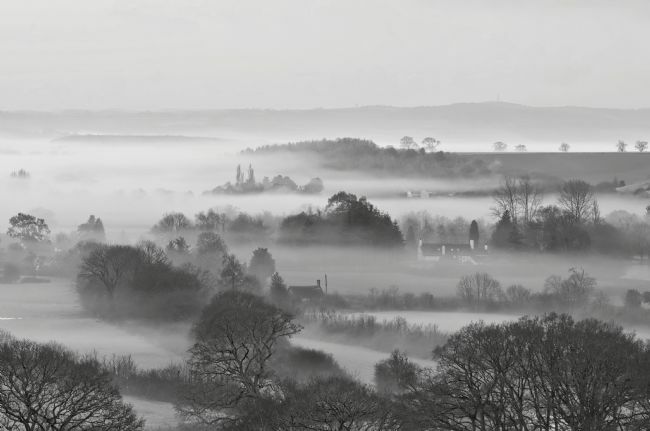 Taken on a cold November morning. 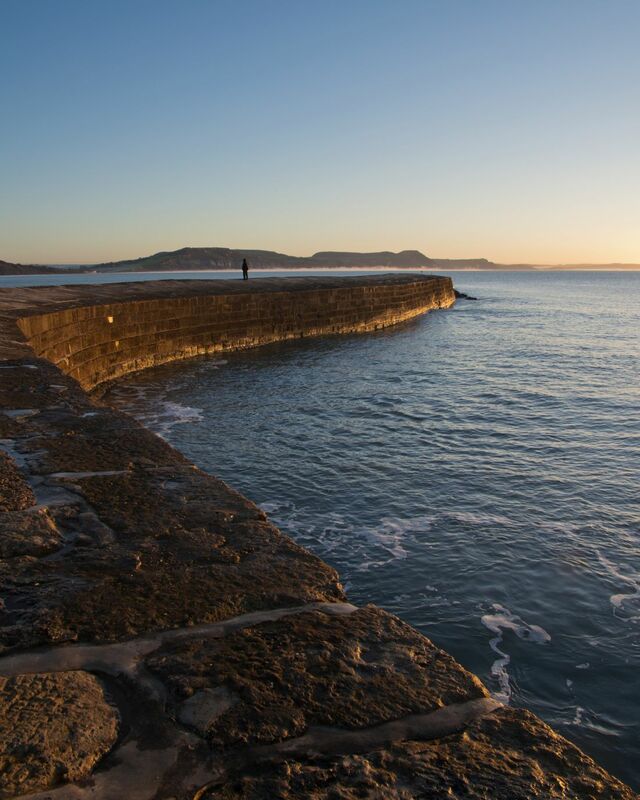 The Cobb at Lyme Regis in Dorset taken with the low slanting rays of first light, a single figure and Golden Cap in the background. Taken on a still frosty November morning. The boats bobbing and a rippled reflection on a full tide at Lyme Regis, around sunrise with Golden Cap and a misty layer in the background. 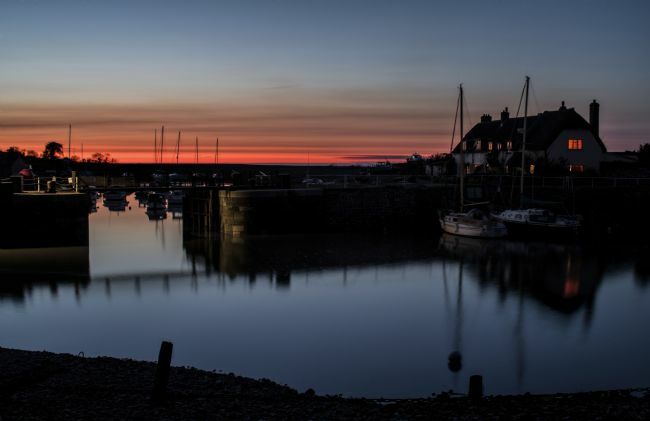 On the edge of Exmoor and the North Somerset coast is the delightful Porlock Weir taken here at dusk with light reflecting off the water and some street light on the boats. 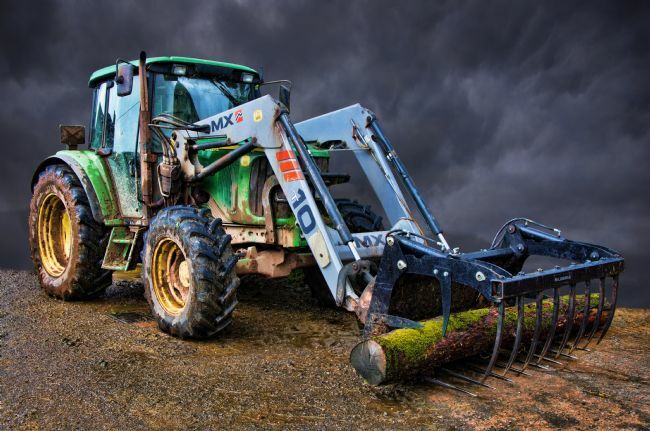 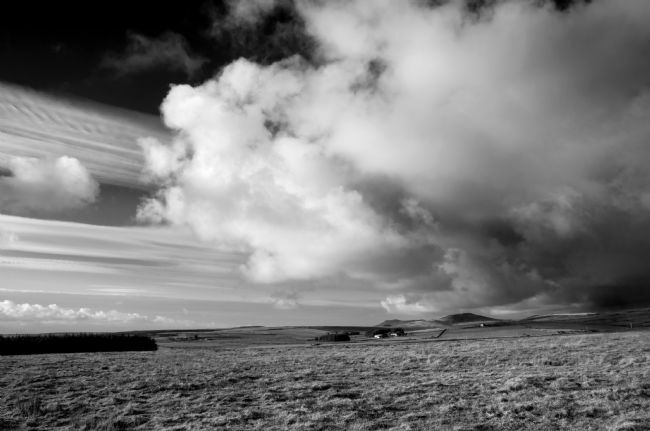 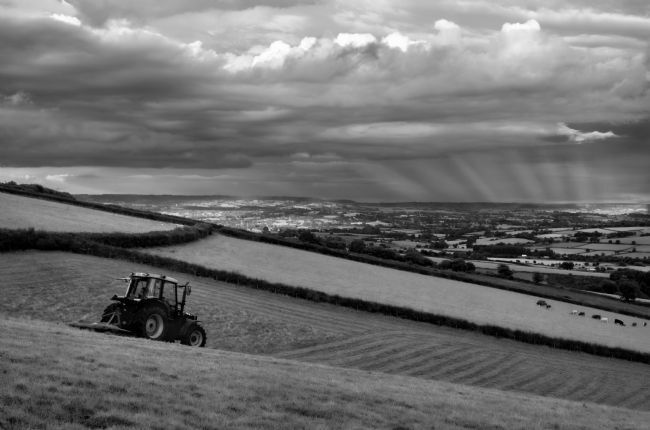 Storm clouds passing over Bodmin Moor in Cornwall. 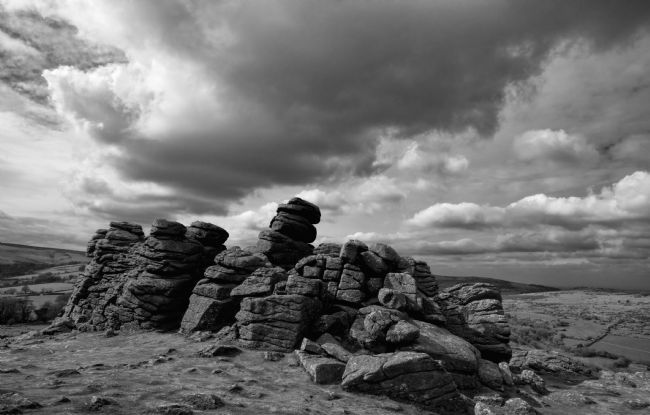 Rough Tor and Brown Willy in the distance, both high points on the moor. 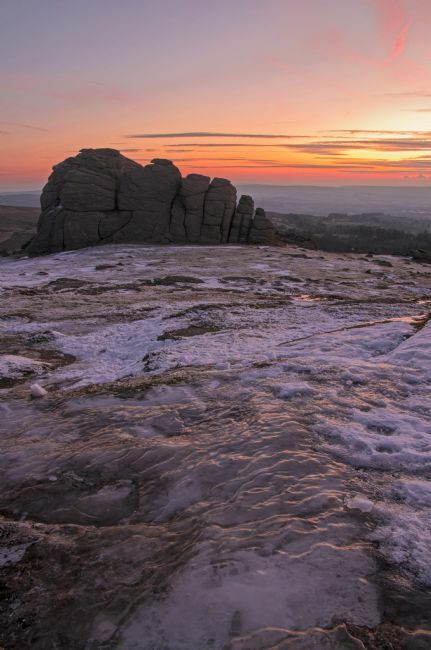 An image taken in February during winter. Fishing boats afloat in the small harbour at Gorran Haven in South Cornwall. 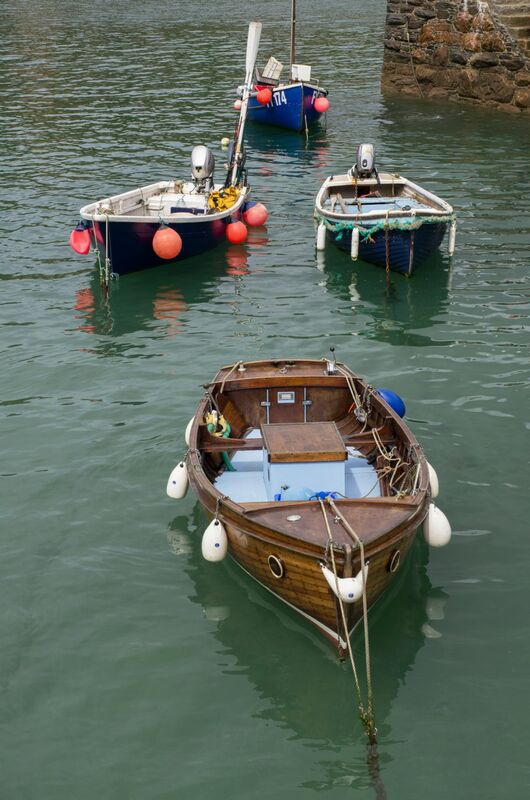 The boats forming a pleasing shape and colourful with the buoys and fishing paraphernalia. 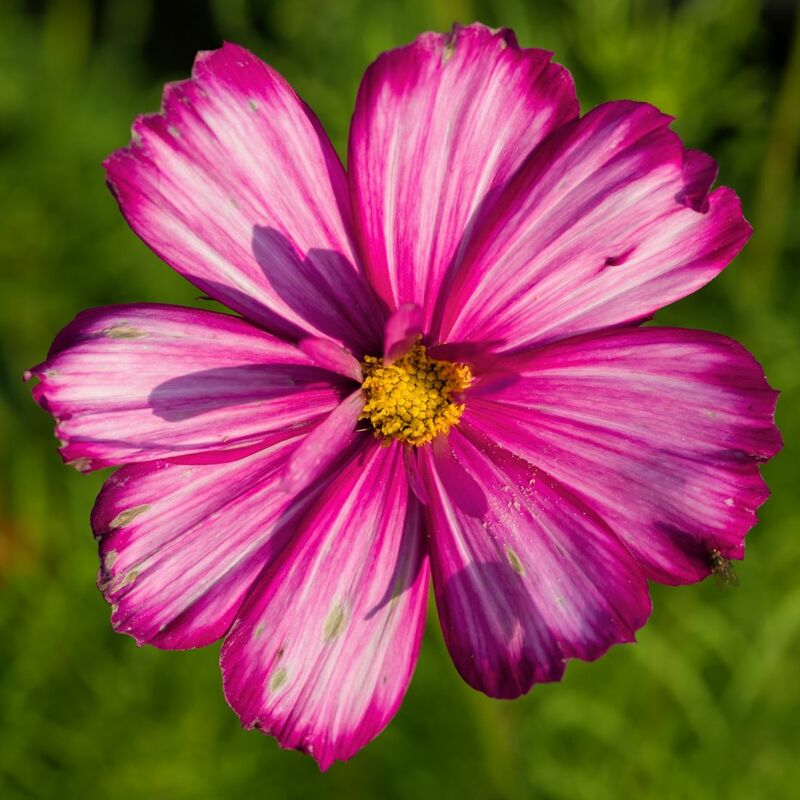 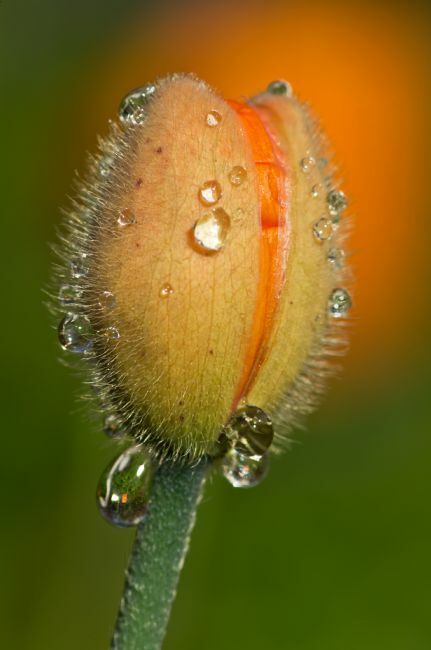 A single flower from a Cosmos plant taken in sunshine in the garden, complete with a little fly paying a visit. 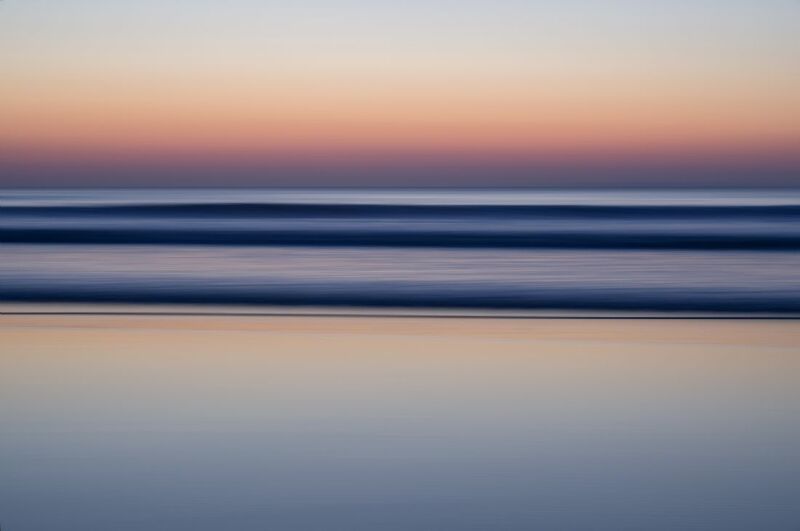 Rendered in symmetrical square format. 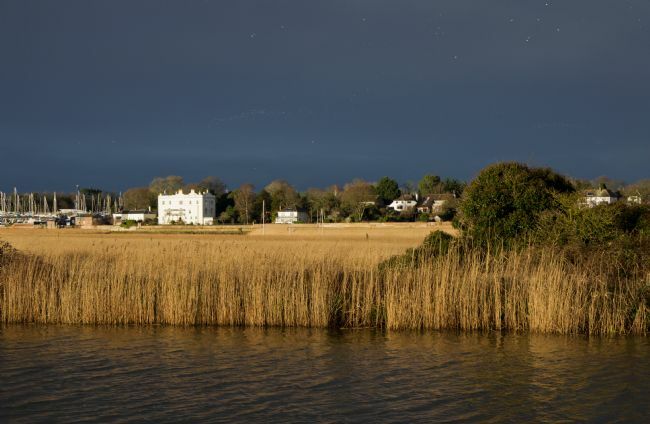 Taking as the sun broke through the clouds on a winters evening to give dramatic light over Exeter canal and reed beds towards boat masts and buildings near Topsham and Exeter in Devon. 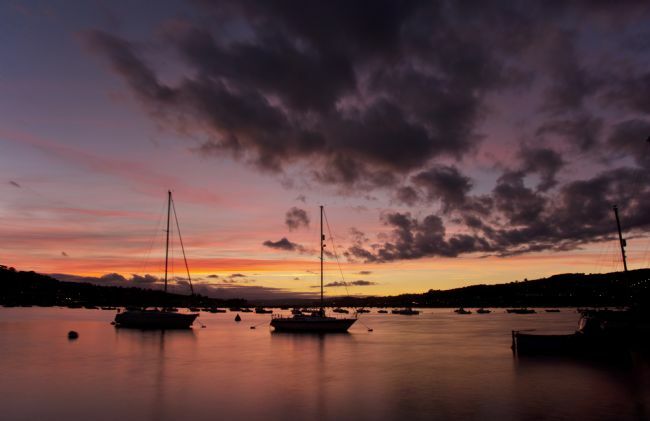 The estuary of River Exe, unseen here, is in between and attracts 1000's of birds. 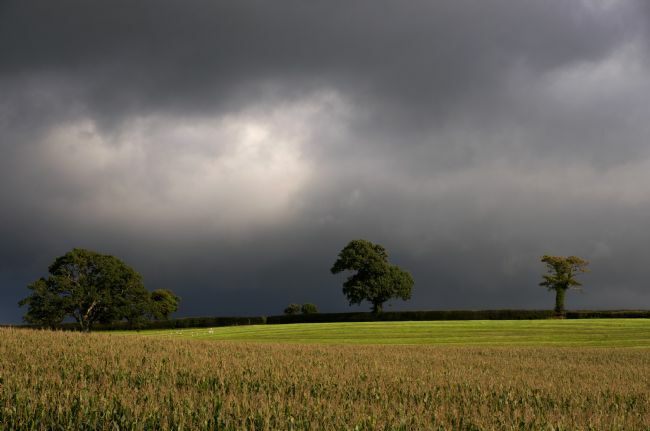 Illuminated birds can be seen flying high here in against the dark clouds. Carne beach at low tide in the summer. 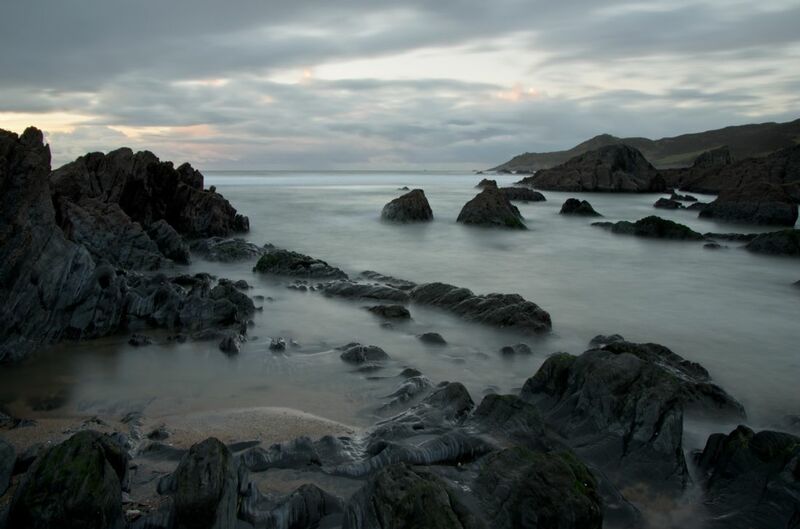 The rocky Nares head reaching out into the sea with fluffy summer clouds and reflections in the wet sand. 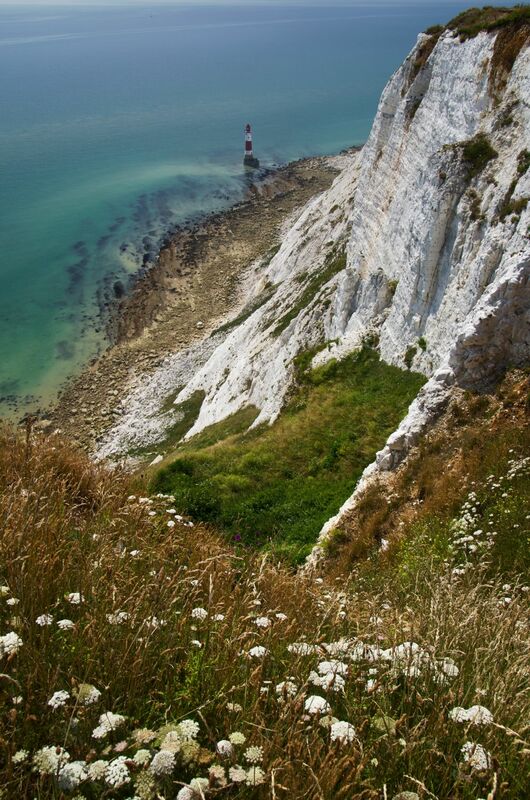 Looking over the edge of chalk cliffs of Beachy head down to the lighthouse, on a summers day. Culmstock on the edge of the Blackdown hills near the Devon Somerset border. 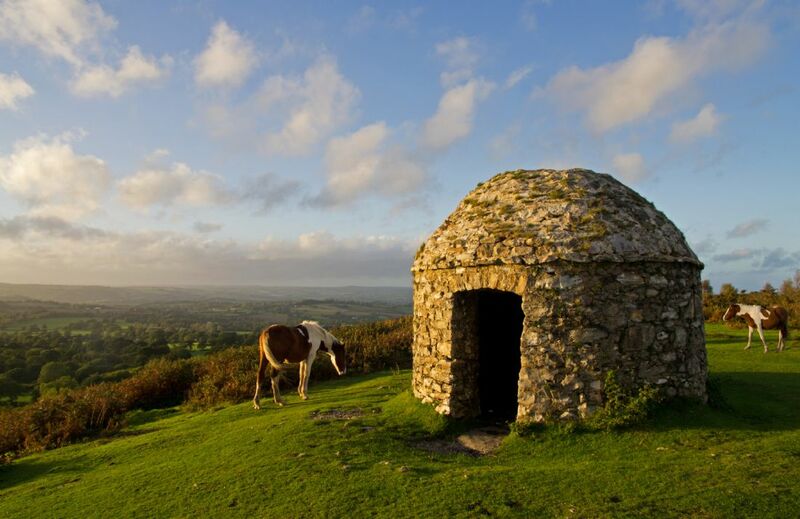 Taken in evening light with two wild ponies. 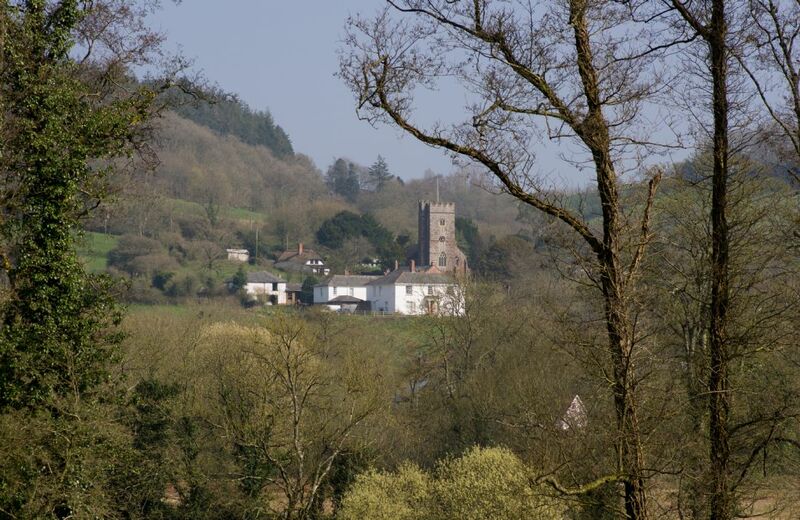 Culmstock is also near the source of the River Culm and there is an ancient signal station here built for the Armada. 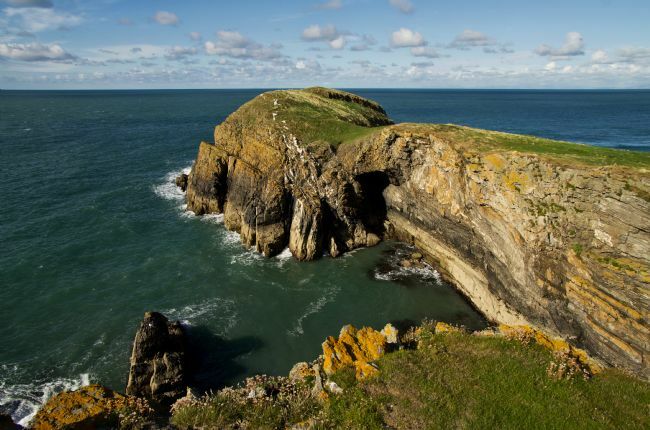 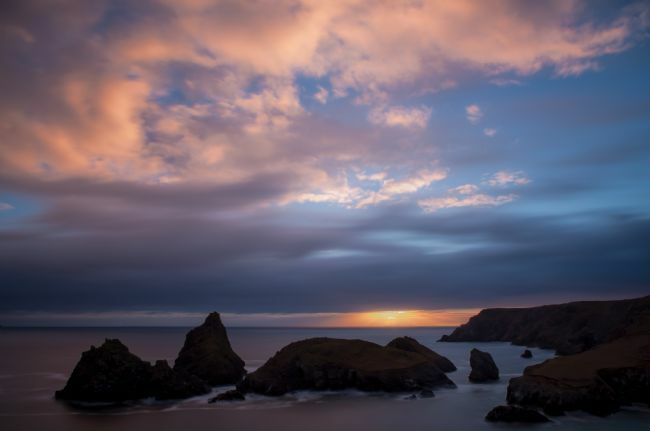 A remarkable headland that points out into the sea like a finger called Ynys Lochtyn on the West Wales coast. 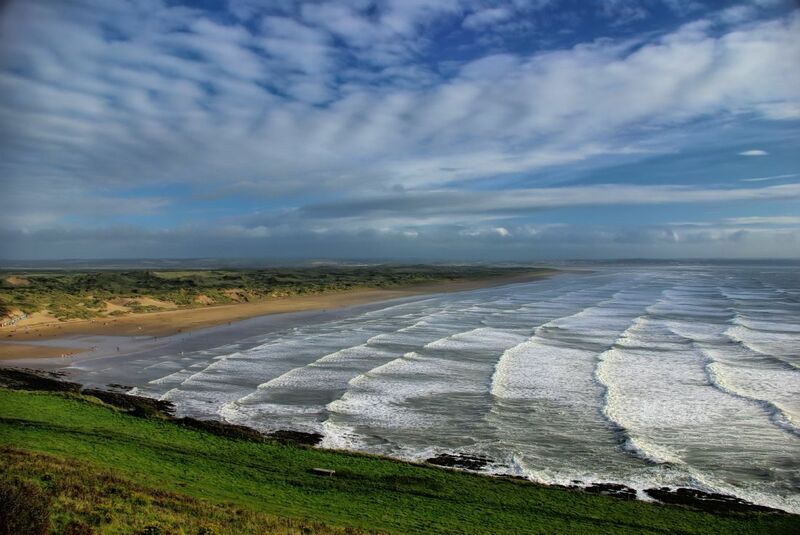 Taken in September with a lazy sea and fluffy clouds on the horizon. 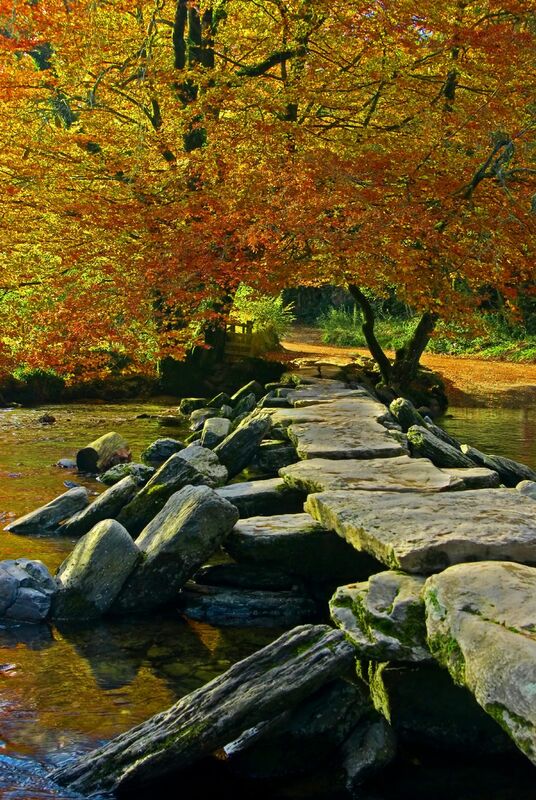 Its exciting to walk right to the end. 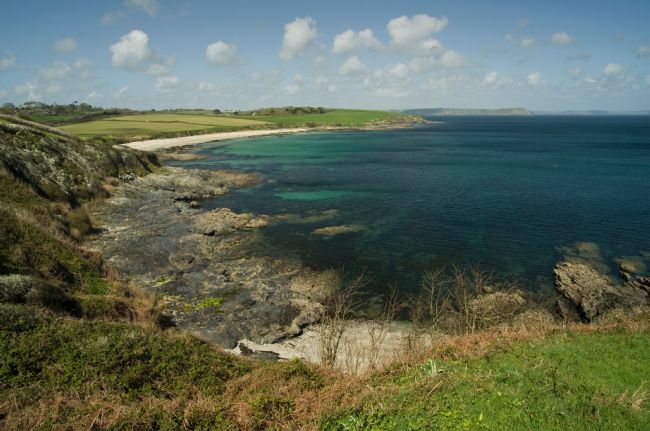 The small surfing cove called Poldu on the west side of the Lizard peninsular in Cornwall. 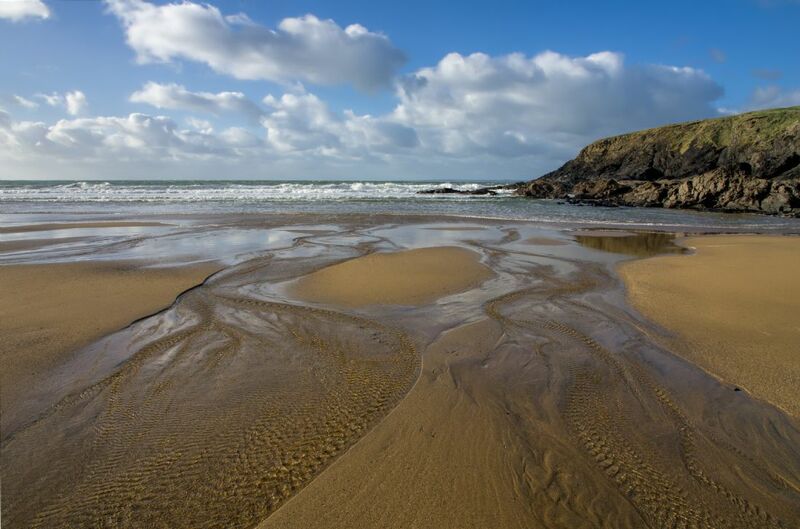 Taken on a sunny winters day with gentle waves and pretty clouds over the sand, with the stream creating sand patterns. 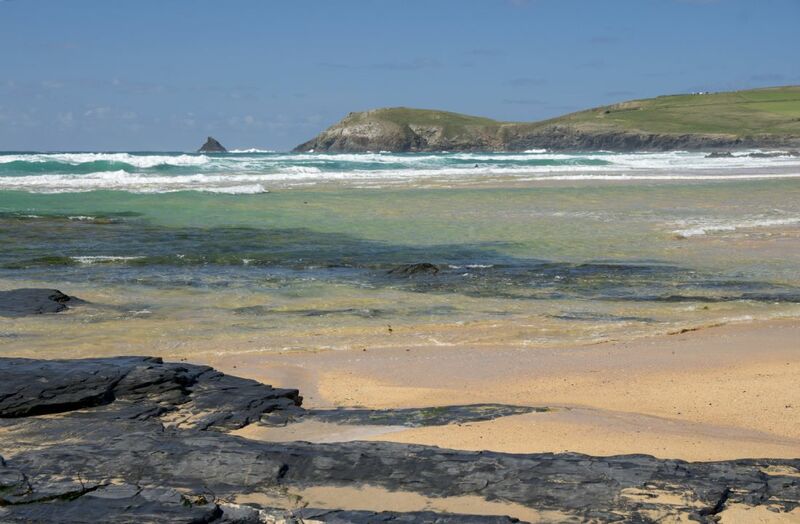 A lovely place for many activities from a winters stroll to good surfing and a delightful beach cafe open for a long season. 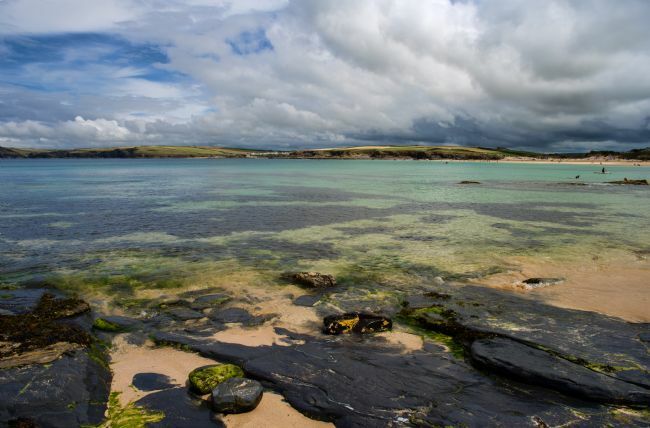 A view of Harlyn Bay in North Cornwall near Padstow with brooding clouds reflecting in the still water. 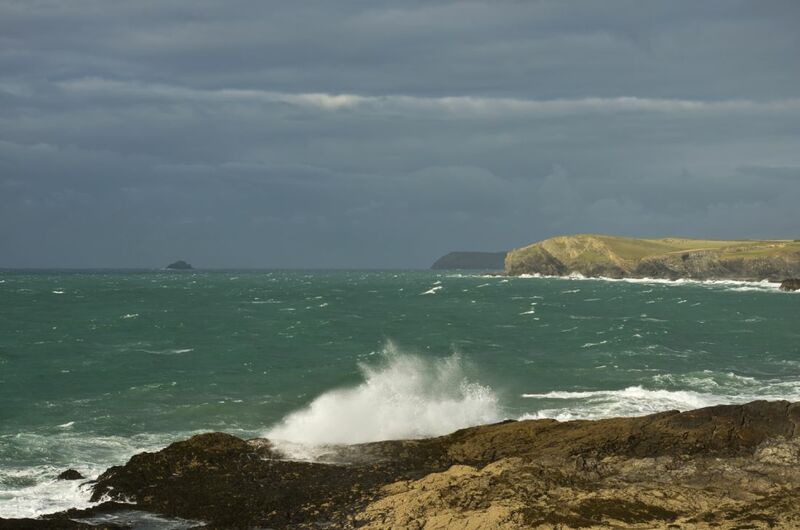 A wintery blustery day at Salcombe Mouth in East Devon looking over Dunscombe Cliff on the Jurassic coast. 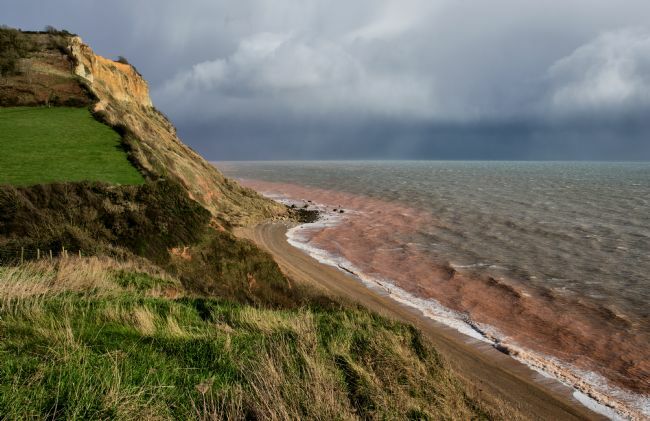 The wind churning up the sea and disturbing the red sand and retreating clouds darkening the horizon while the sun makes a bright contrasty foreground. 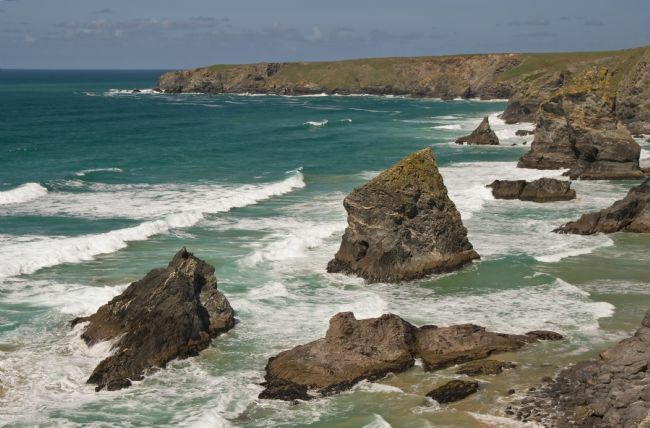 Bedruthan steps on a windy April day. These are in an impressive part of the North Cornish coast line. The beach is accessible at low tide via a steep set of steps. 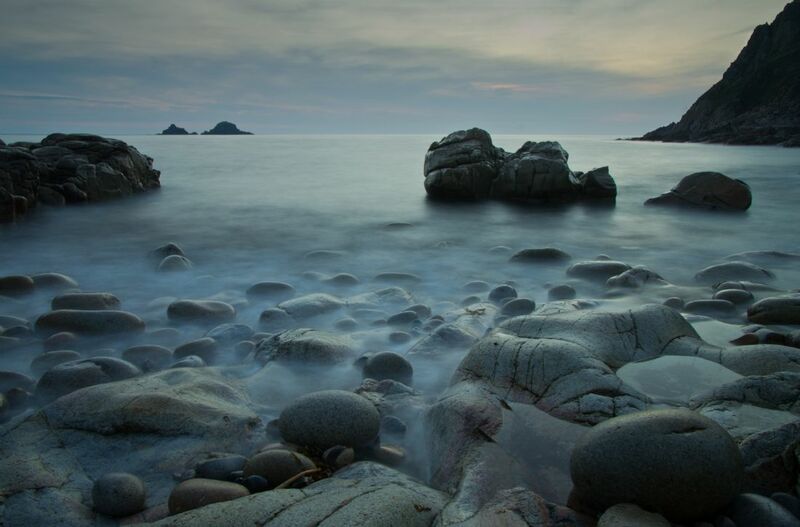 A long exposure taken after sunset at Porth Nanven on the far west of Cornwall near Cape Cornwall.The last of the evening light on the calm sea. The rounded rocks are part of a site of special scientific significance. 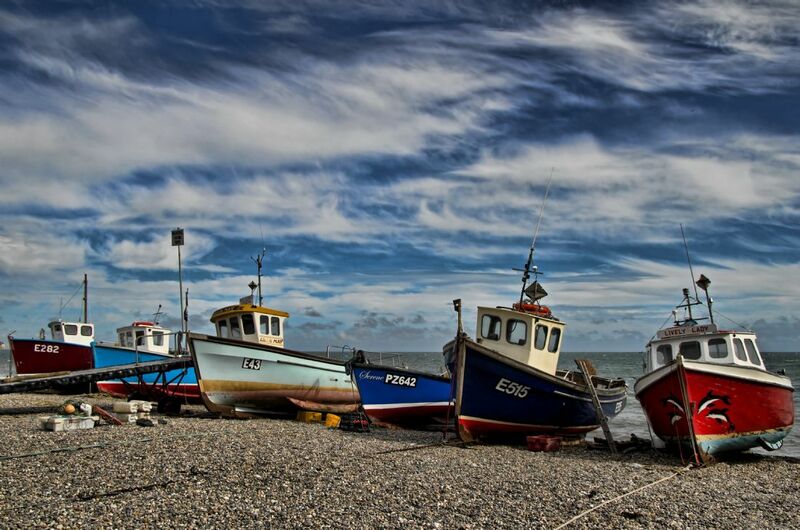 The fishing boats on the shingle beach of Beer in East Devon all lined up after a days work. 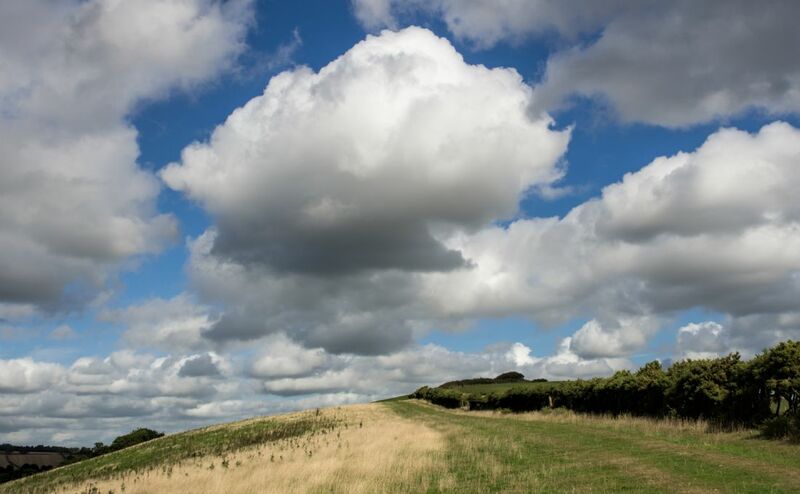 Complete with a whispy cloudy sky as backdrop. 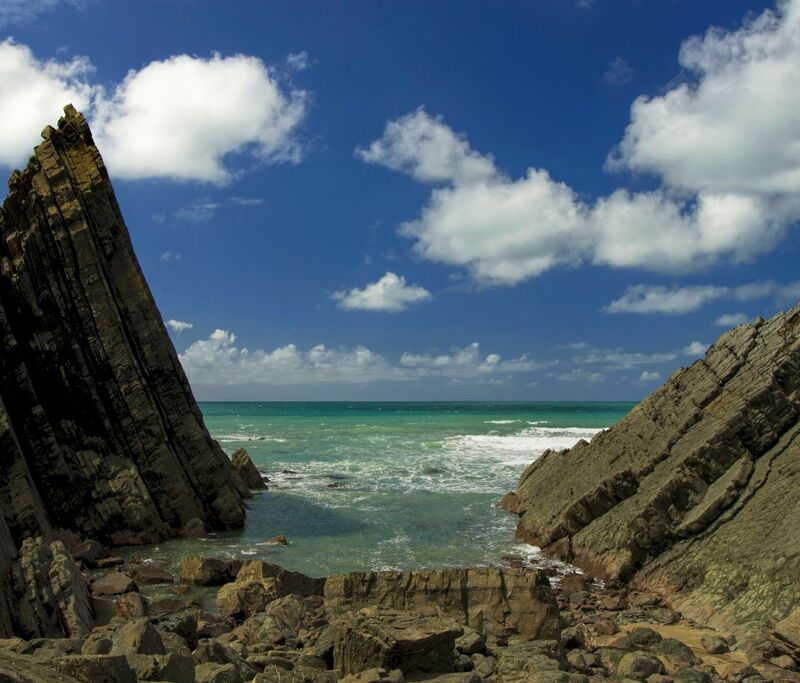 This place is a popular scenic resort and a good place for Mackerel fishing and for photographers. 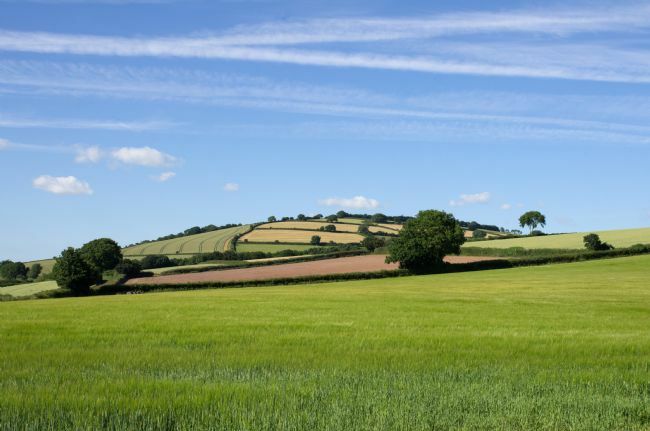 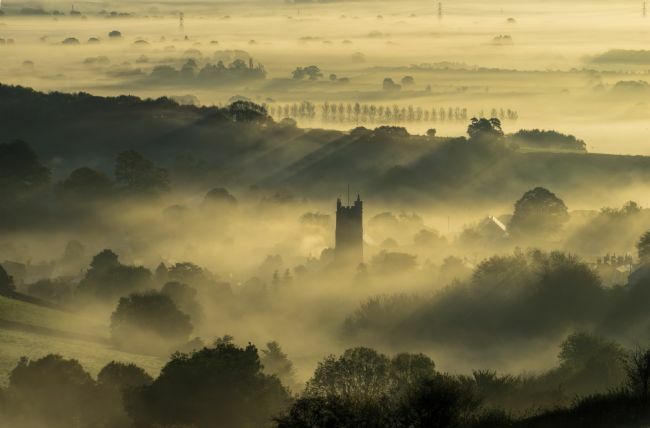 A view of Devon fields near the Duchy town of Bradninch taken early in the morning in September with dew and low sunlight casting long shadows. 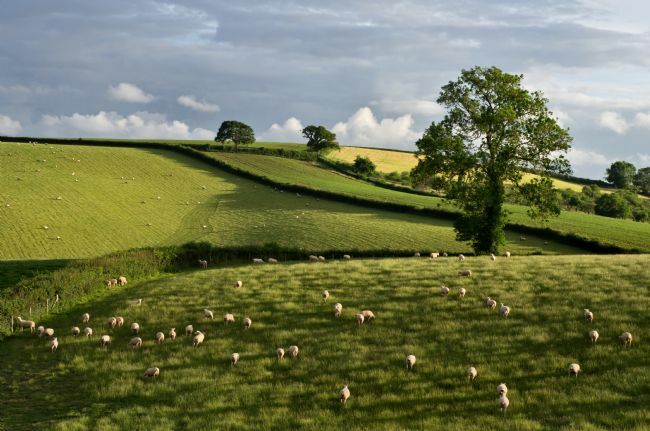 Sheep grazing in a field that catches the warming sunlight. 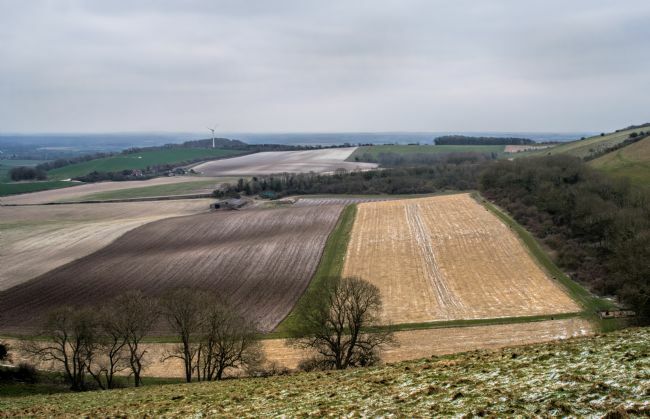 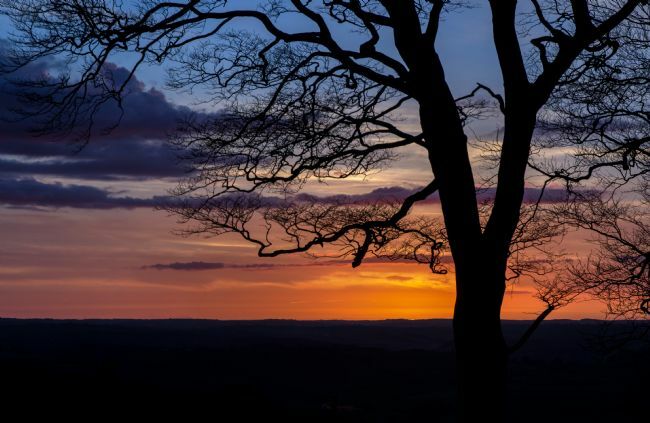 Taken from the hills called Yarde Downs. At the end of the promenade near the River Sid looking East towards Branscombe, showing the fishing boats on a cloudy day as the sun broke through. 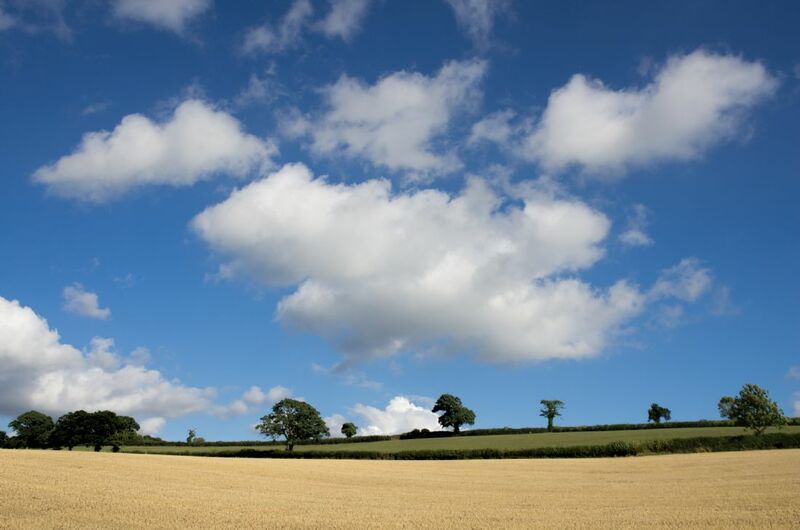 Early summer in June. 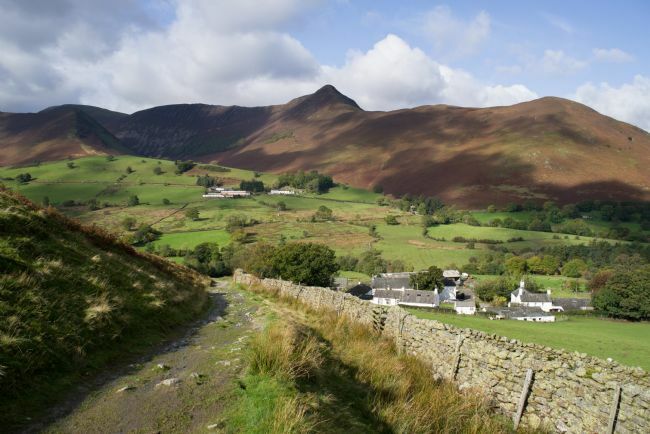 Taken in the Newlands Valley area of the Lake District from just above Little Town looking west over Birkrigg Farm to Causey Pike on a bright Autumn day with the colourful bracken and clouds shadows playing over the fells. 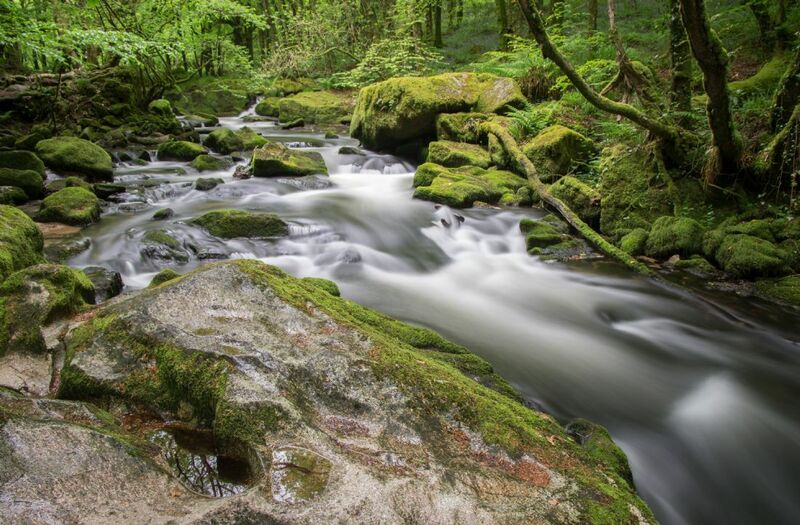 A green spring view of part of Golitha Fall on Bodmin Moor in Cornwall. 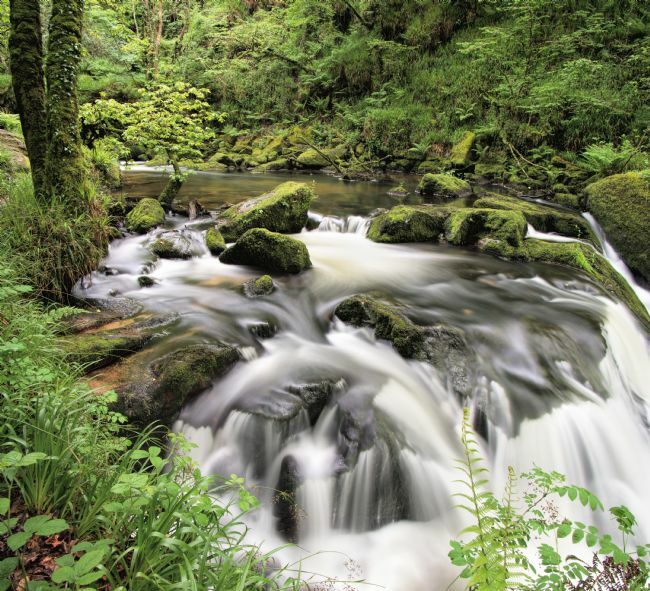 The falls are in a picturesque part of the River Fowey, which flows from the heart of the moor down to the sea at the town of Fowey. 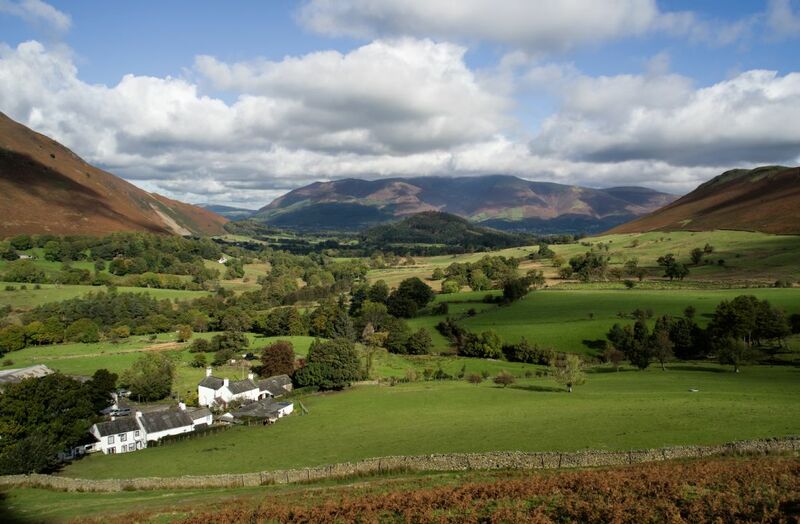 A view of the fells on the North side of Skiddaw in Cumbria. From Horsemoor Hills over Dash Beck to Little and Great Calva. 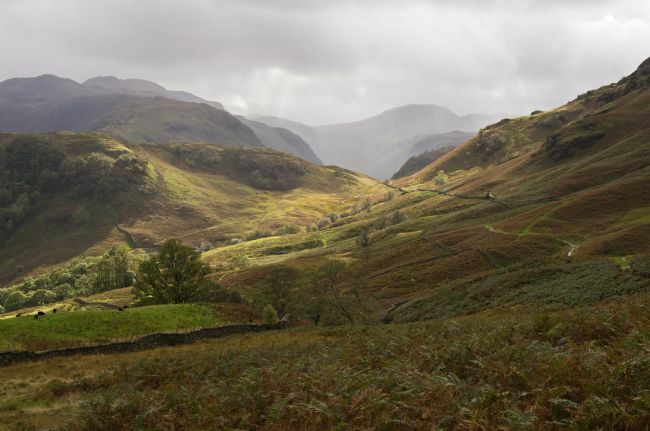 Taken in Autumn light late in the afternoon in October with patches of colourful bracken. 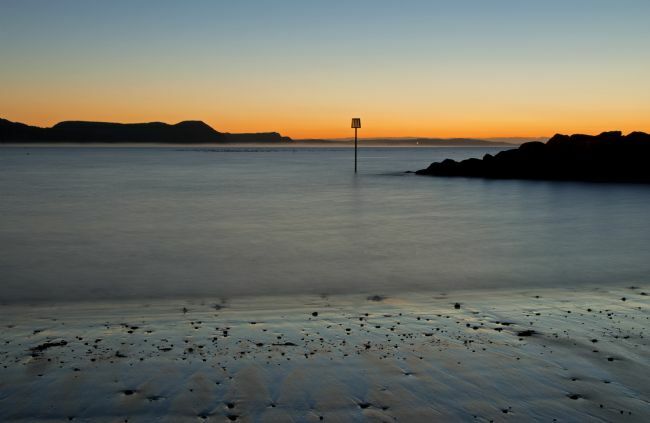 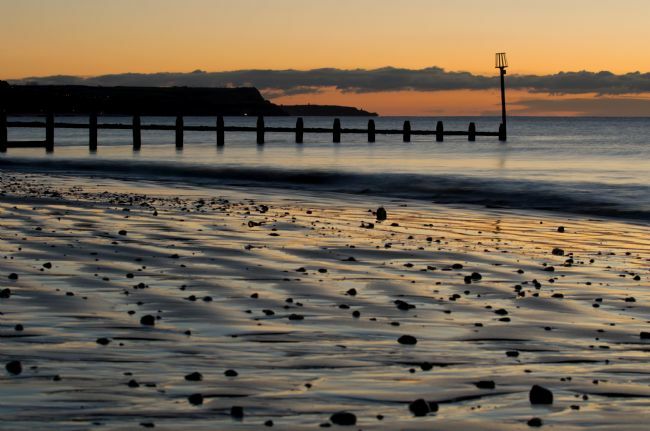 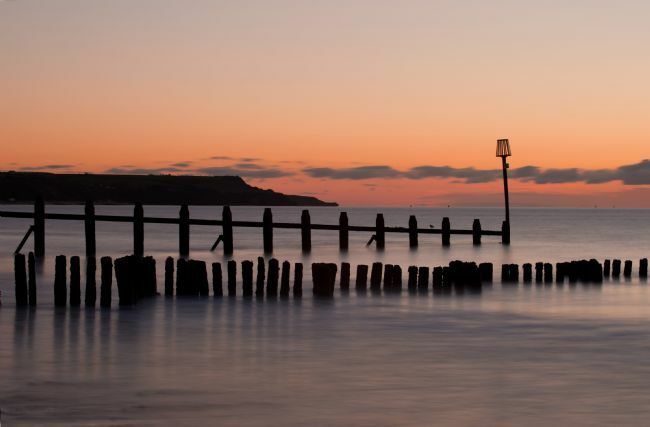 A pre dawn shot of the groynes and hills near Exmouth over the sea from Dawlish Warren in Devon. The low tide reveals pebbles in the sand. 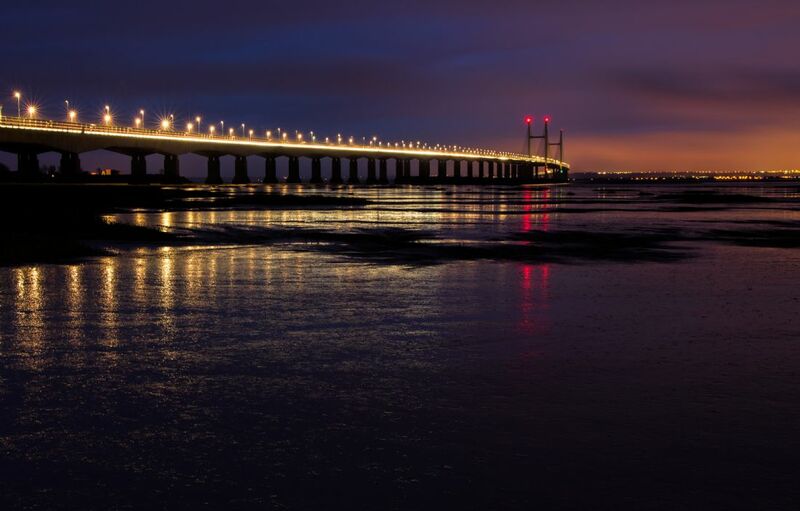 A long exposure to create a smooth effect on the sea. The Warren is a spit across the River Exe estuary. 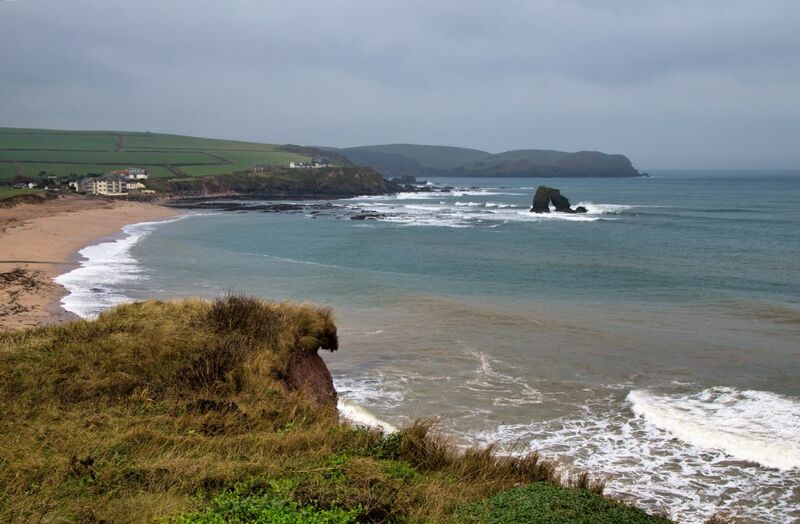 The view over Thurlestone Sands and Rock towards Bolt Tail in the South Hams part of Devon. 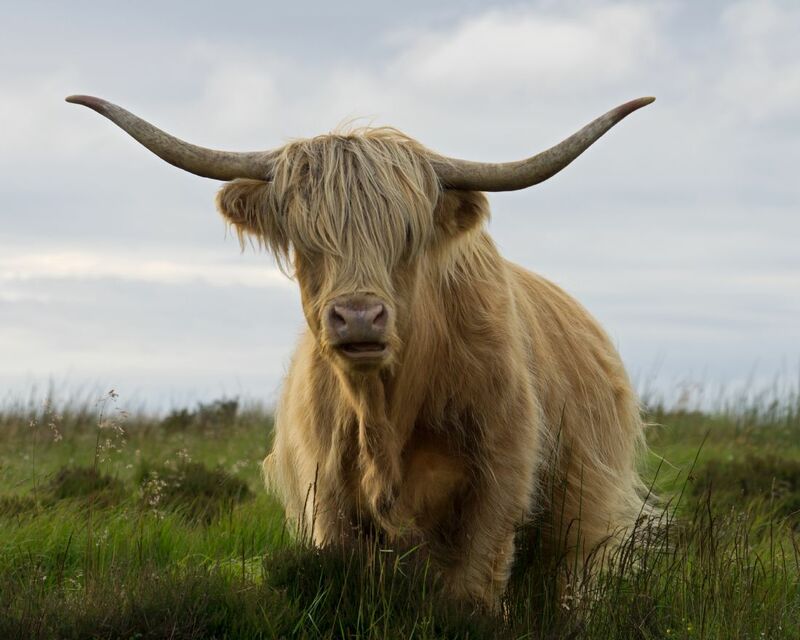 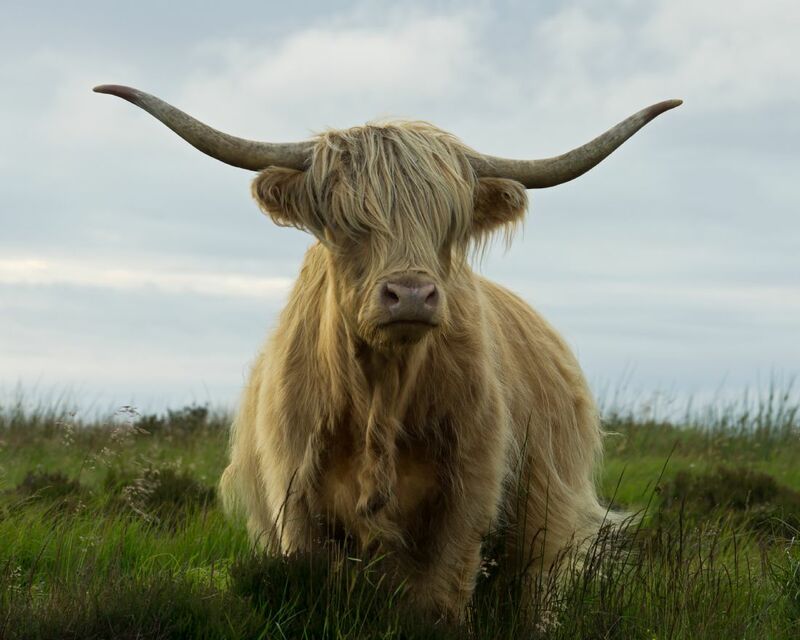 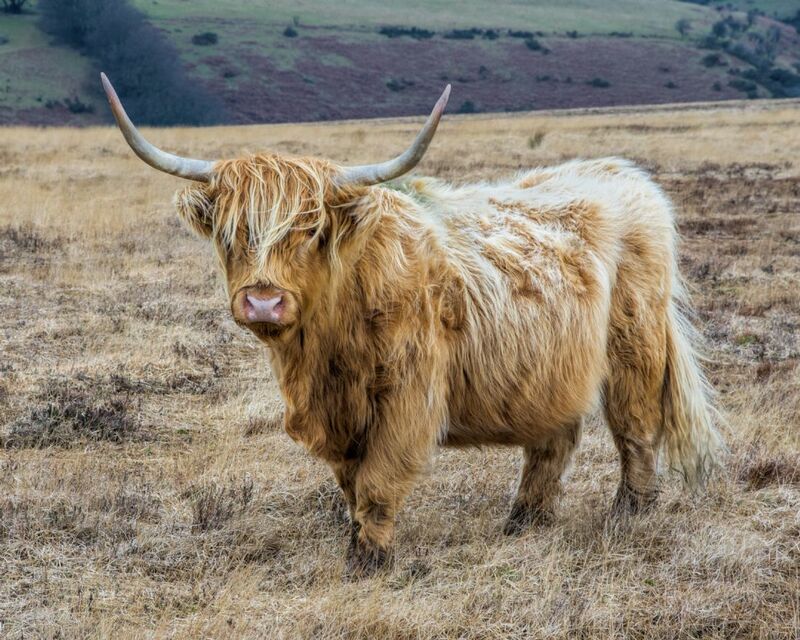 Taken on a blustery winters day. 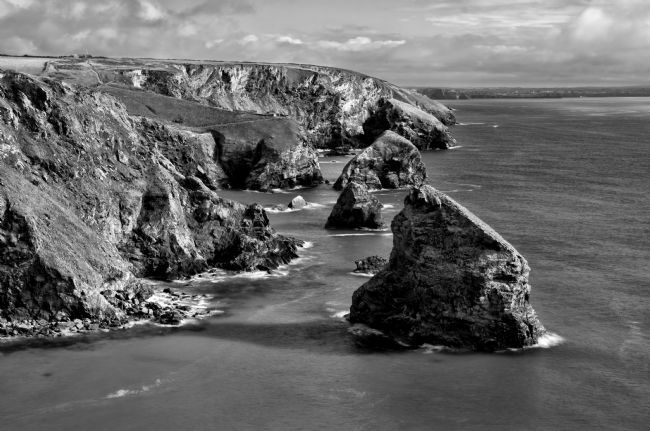 A beautiful part of the South West Coastal Path. 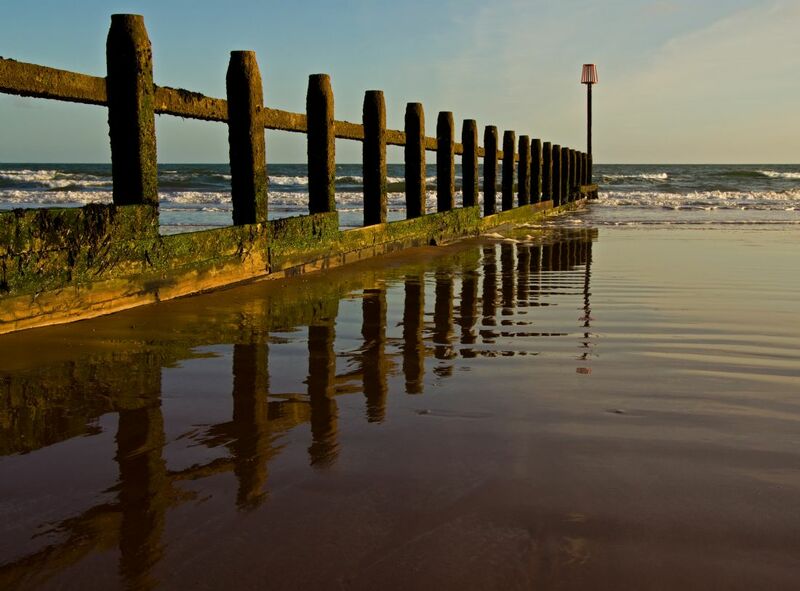 A shot of an old groyne reflected in the wet sand on a winters day at Dawlish Warren. The Spit at the mouth of the Exe has a sandy beach and wildlife reserve. 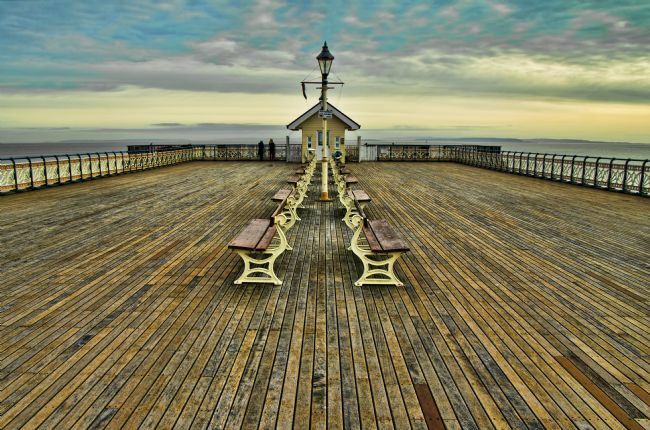 The Pier at Penarth in South Wales, with enhanced colours on a winters day. A symmetrical view. 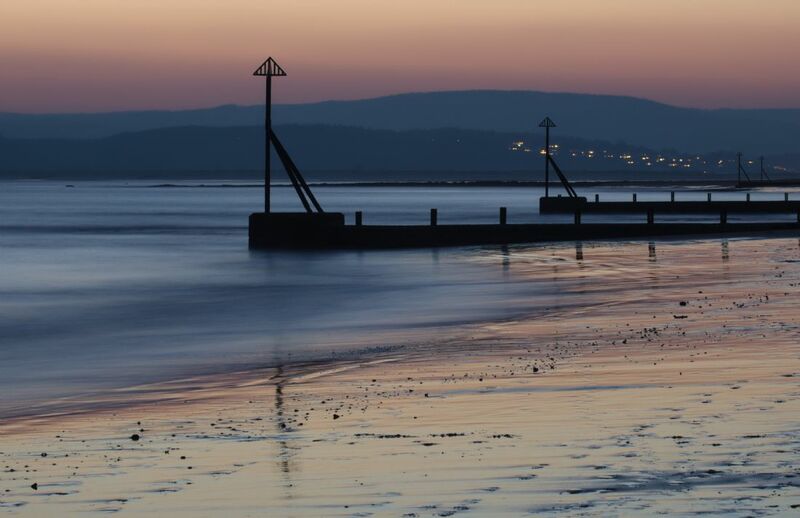 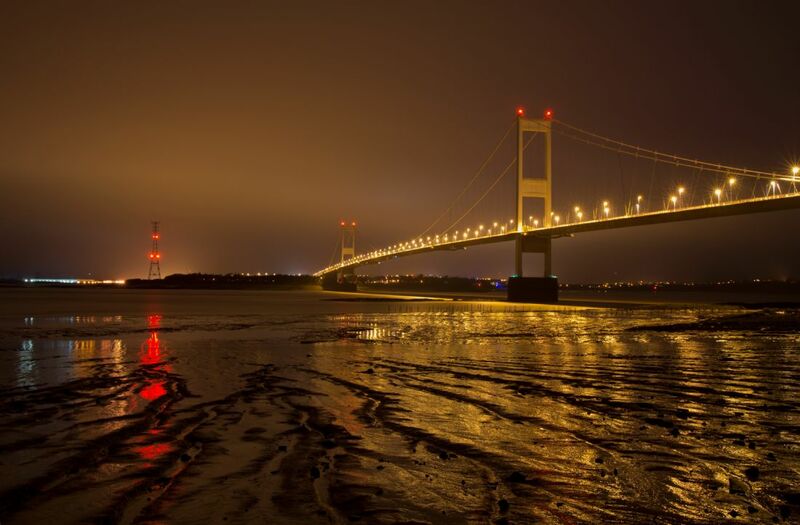 Penarth is in the vale of Glamorgan, the pier was opened in 1895. 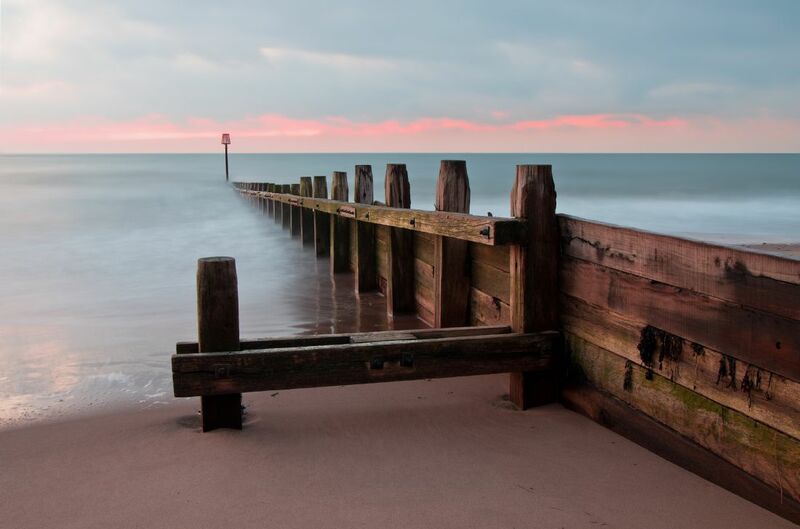 The groynes on Dawlish Warren beach, on a cold winters day looking out to sea. 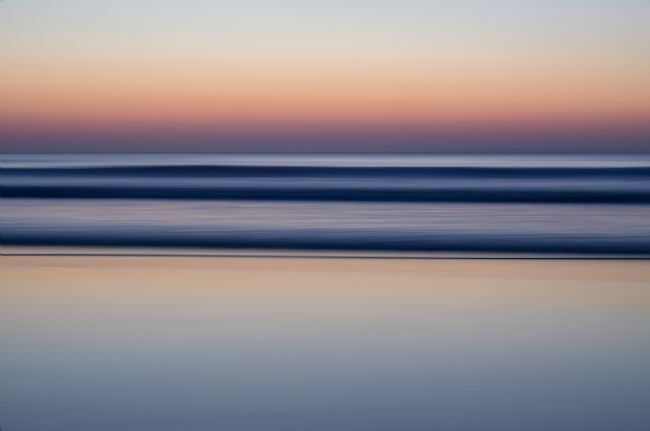 A long exposure which renders the sea with a silky surface. 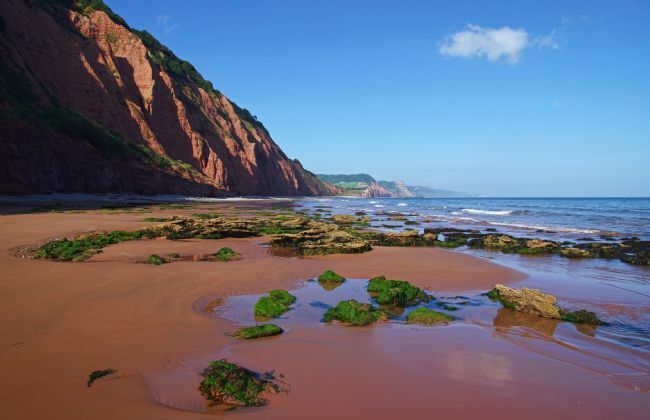 The Warren is a spit across the Exe Estuary and is an important reserve for 1000s of birds. A pre dawn shot of the groynes and hills near Exmouth over the sea from Dawlish Warren in Devon. 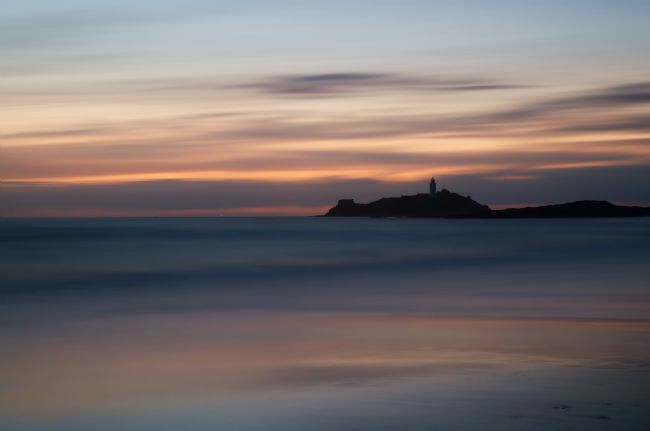 A long exposure to create a smooth effect on the sea. 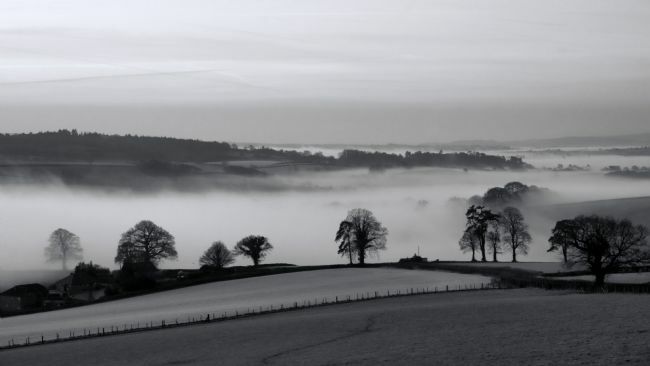 The Warren is a spit across the River Exe estuary. A late afternoon shot from Bidwell Cross near Thorverton looking over the Exe valley and showing the harvest nearing readiness. Golitha Falls on the Fowey River as it flows through Bodmin Moor. 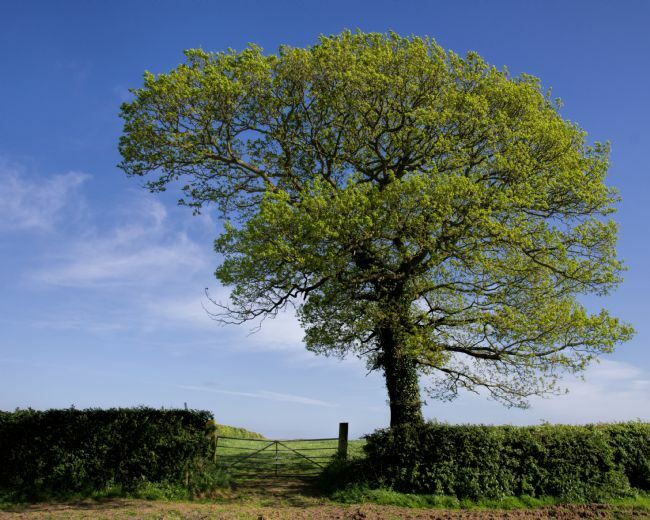 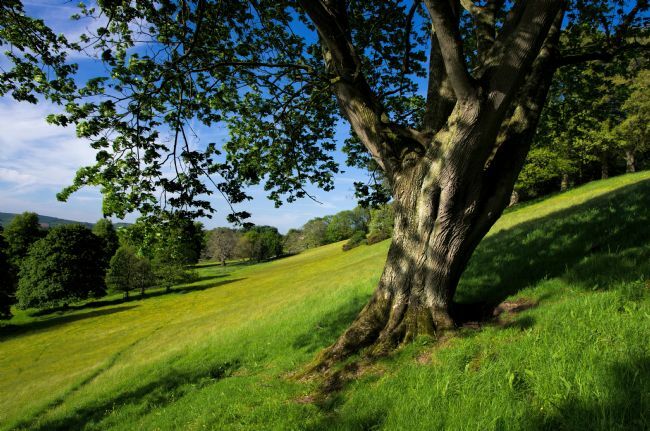 A square format shot taken in May with the trees and foliage all fresh and green. 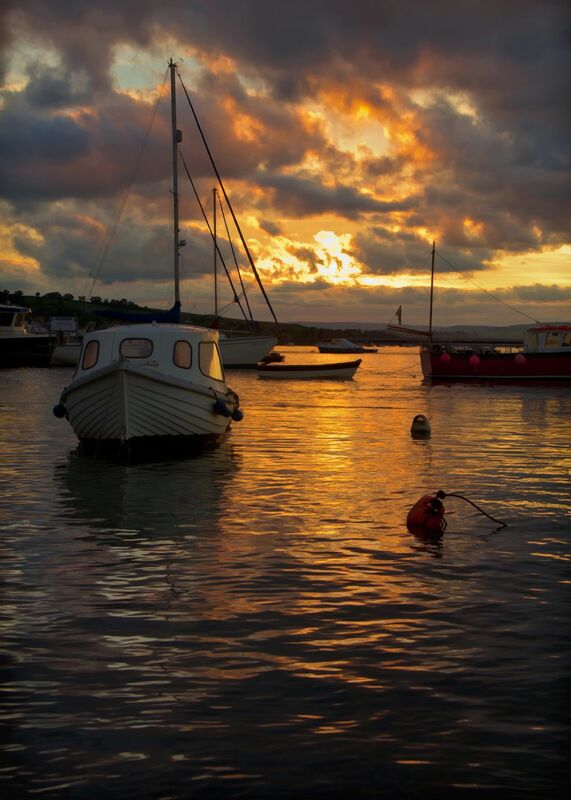 A sunset on the Teign Estuary at high tide looking up stream. The river Teign has a harbour area at the mouth of the river at the town of Teignmouth in South Devon. 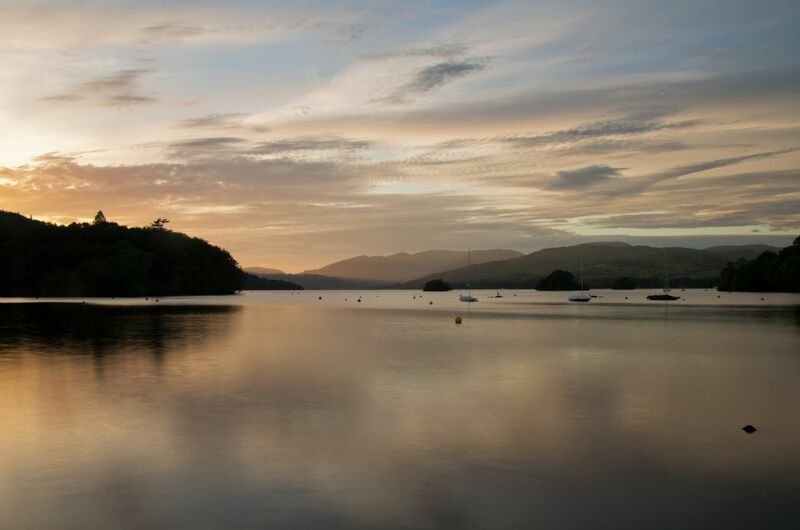 An evening image of Lake Windermere in the lake district taken from Bowness with Belle Island on the left and the last rays of sunlight catching Fairfield mountain range in the distance. A long exposure taken in July at sunset of Porth Nanven on the far west of Cornwall near the Cape looking towards the off shore rocks called The Brisons. Porth Naven is at the mouth of the Cot valley. 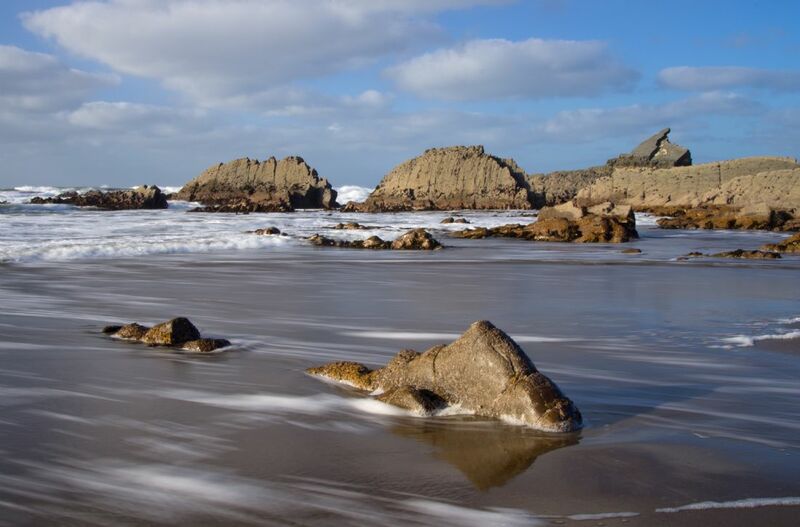 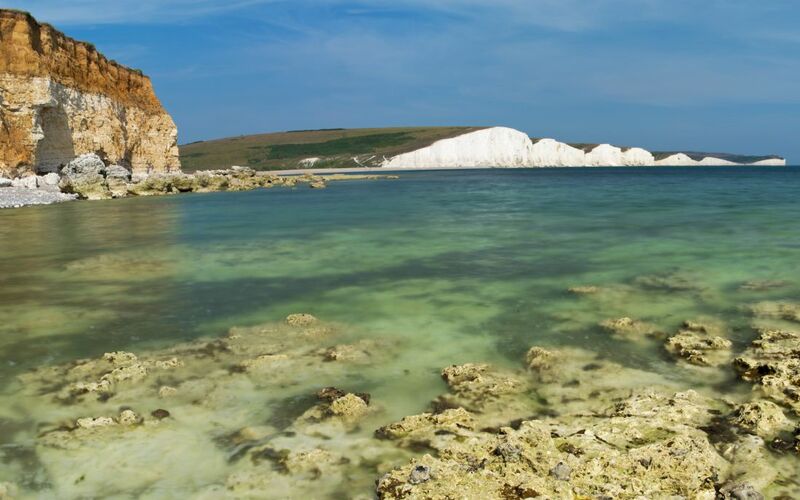 The rounded beach and rocks are a site of special scientific significance. 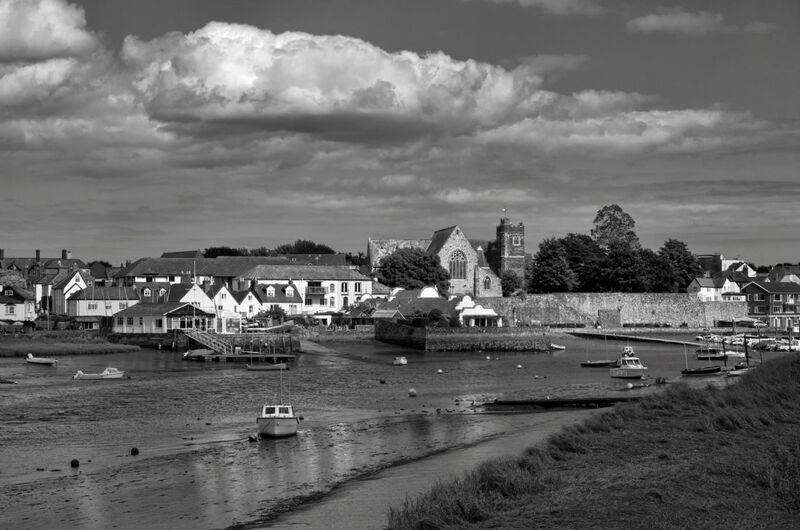 A view of Topsham from across the River Exe from the Canal Lock Cafe. 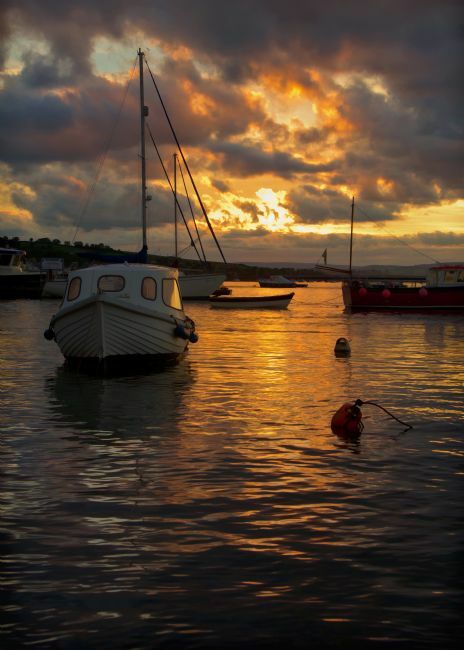 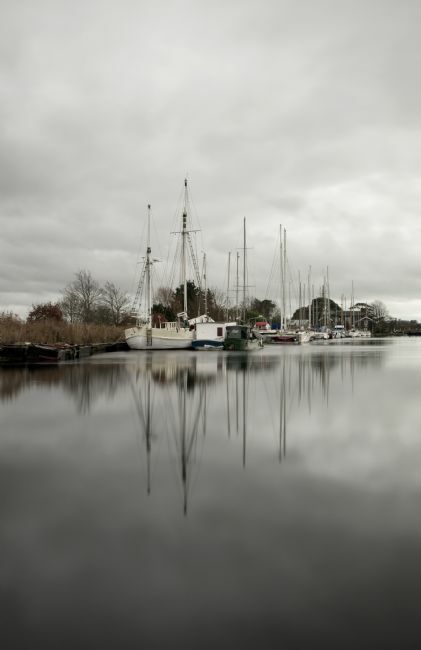 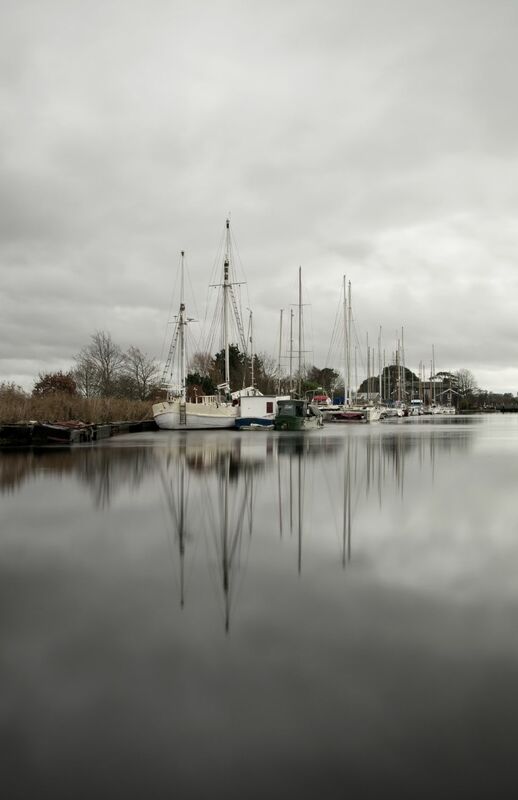 A delightful little town, just outside of Exeter on the tidal Exe estuary with strong nautical connections dating back to the civil war and wide views of the water. 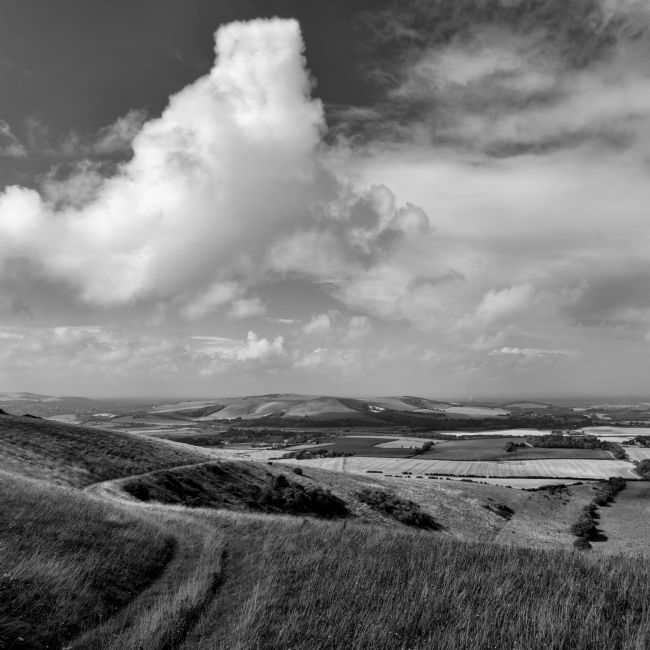 This view was taken in July on a lovely sunny afternoon and well suited to Black and White. 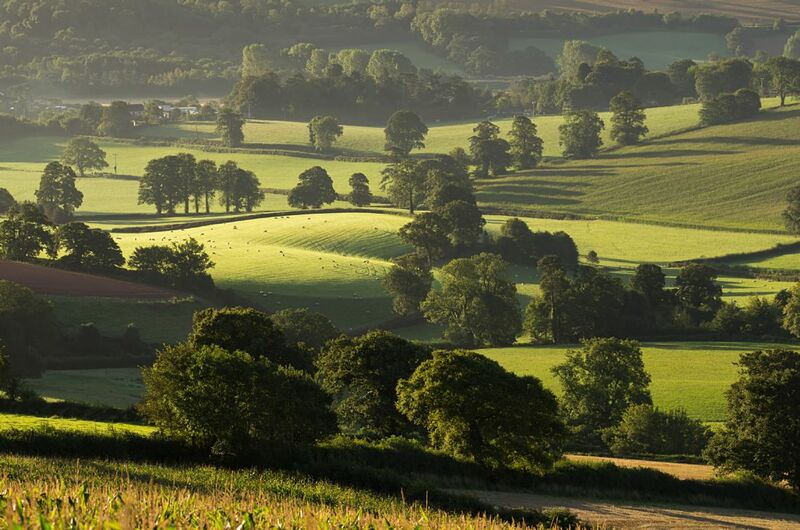 Near Thorverton the River Exe passes through some picturesque hills and farm land where the fields form a random tapestry. 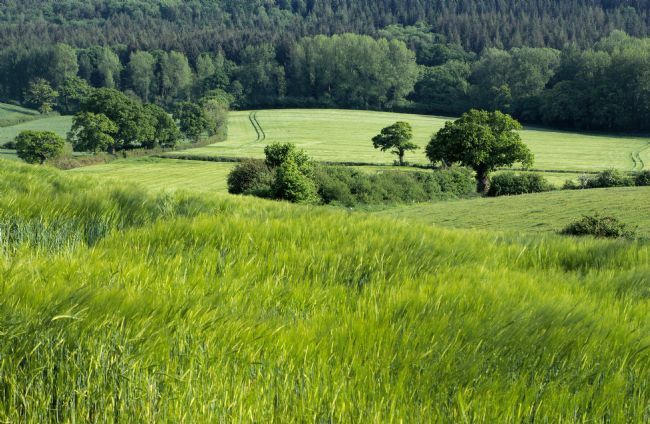 Here the Harvest is just days before being gathered. 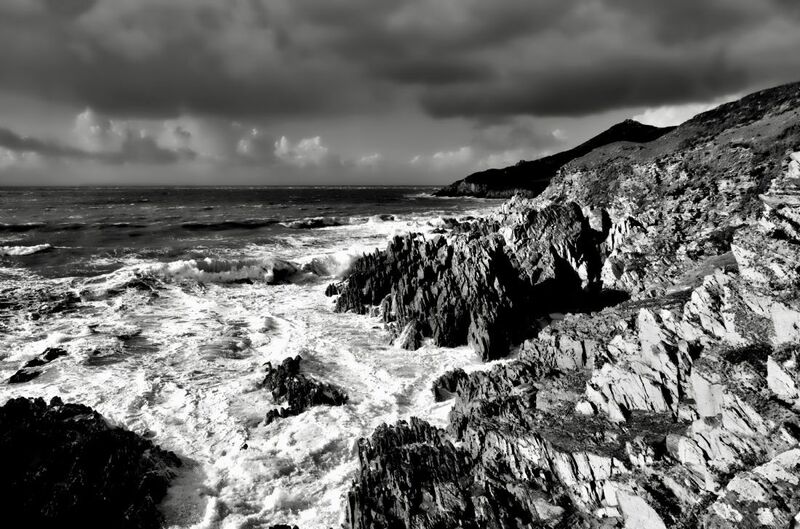 Taken on the blustery day after the St Jude storm (on 28th Oct 2013) from near Woolacombe in North Devon looking towards Morte Point. 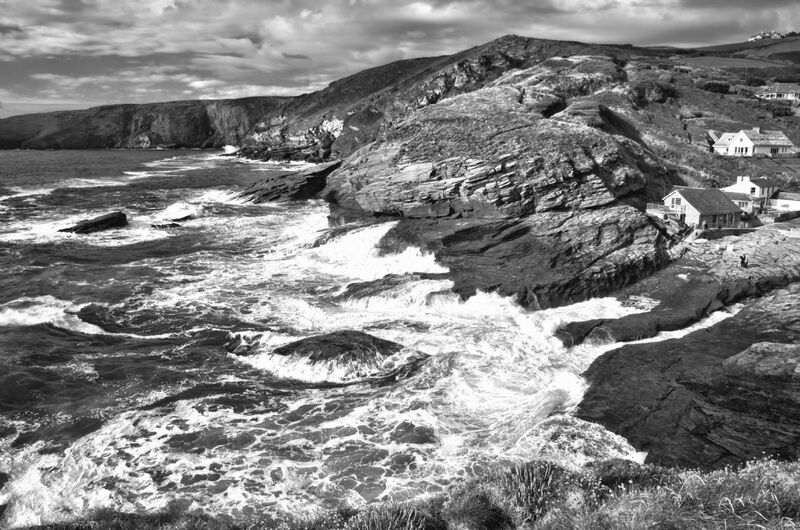 The sea rushing in on its relentless task of eroding the rugged coastline and with a lowering sky. Saunton Sands and Braunton Burrows near the Taw River mouth in N Devon, a popular beach for surfing and kiteing. 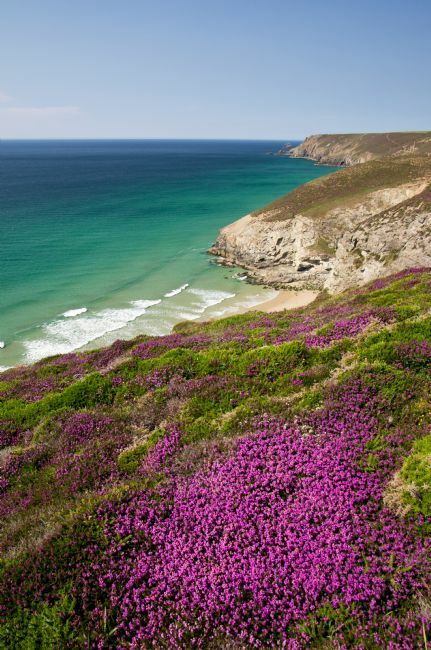 A summer shot showing patches of flowering heather on the North Cornwall coast. 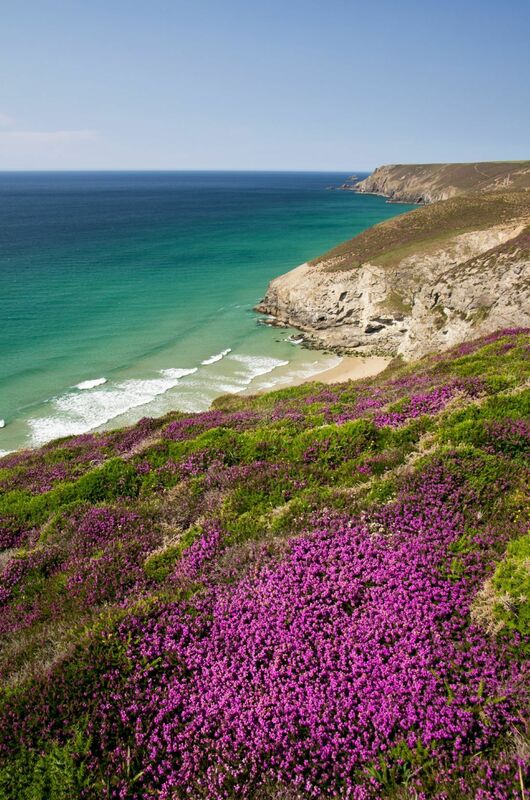 This was just North East of Porthtowan towards Chapel Porth and St Agnes head. 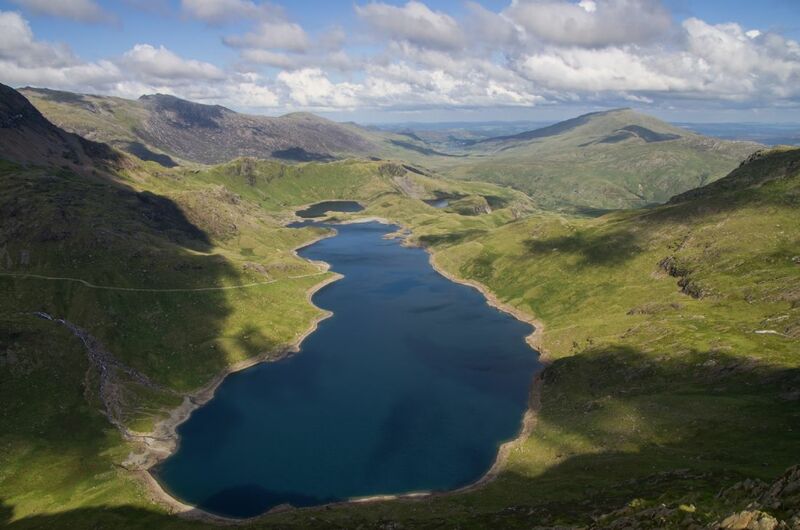 The disused mine of Chy is just visible. 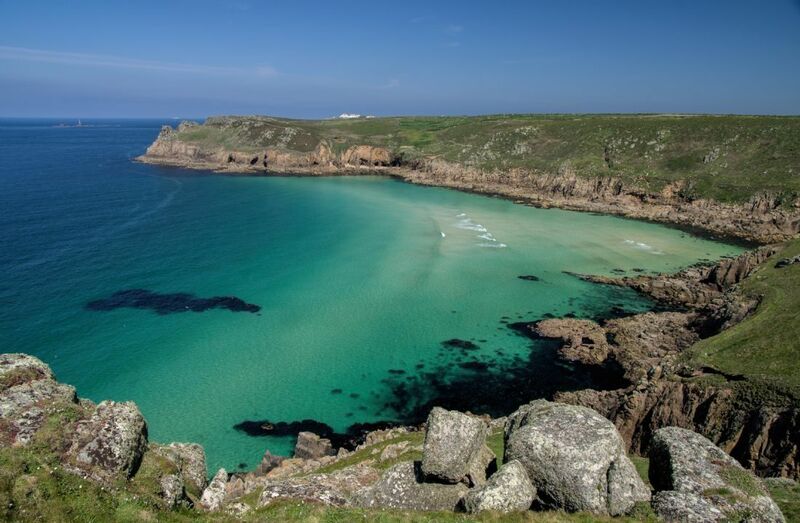 The sea shows the rich colours typical of Cornwall on a sunny day, with a little lazy surf. 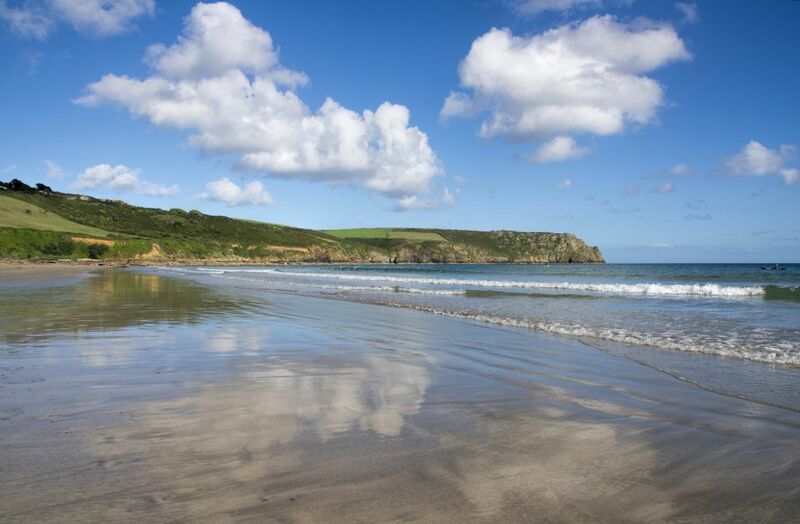 The remote beach called Nanjizal or Mill Bay in far west Cornwall taken on a sunny spring day, with azure sea and gentle ripples. 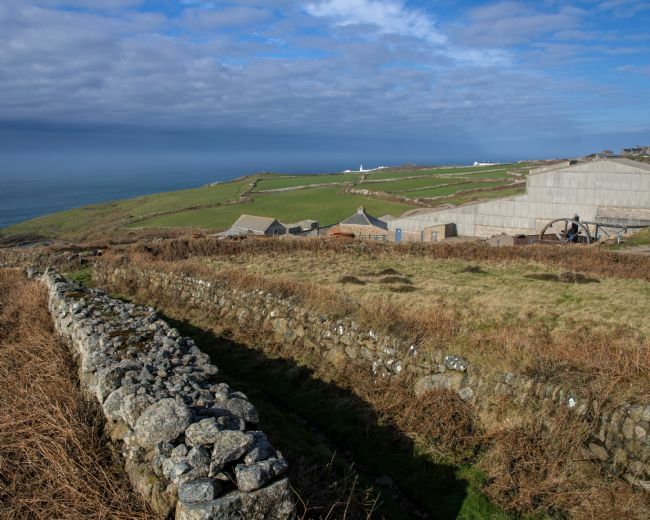 Landsend buildings and longships light house just visible. 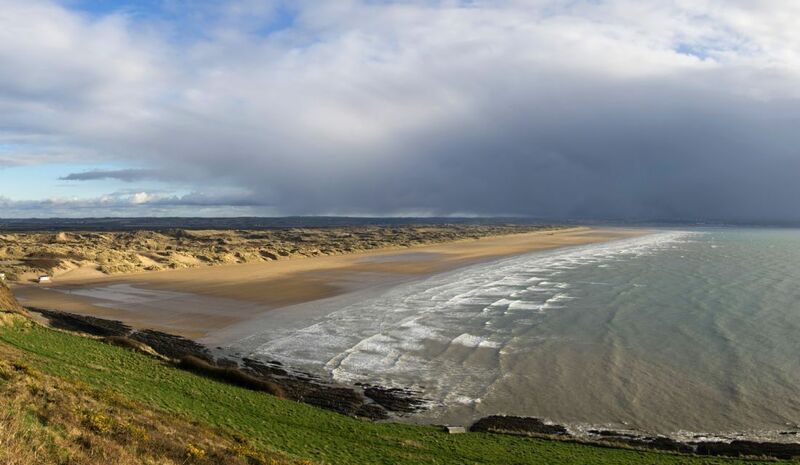 Clouds brewing over the vast expanse of Saunton Sands near the Taw Estuary in North Devon. The sun shining on the foreground and the sand dunes of Braunton Burrows receding into the distant clouds. 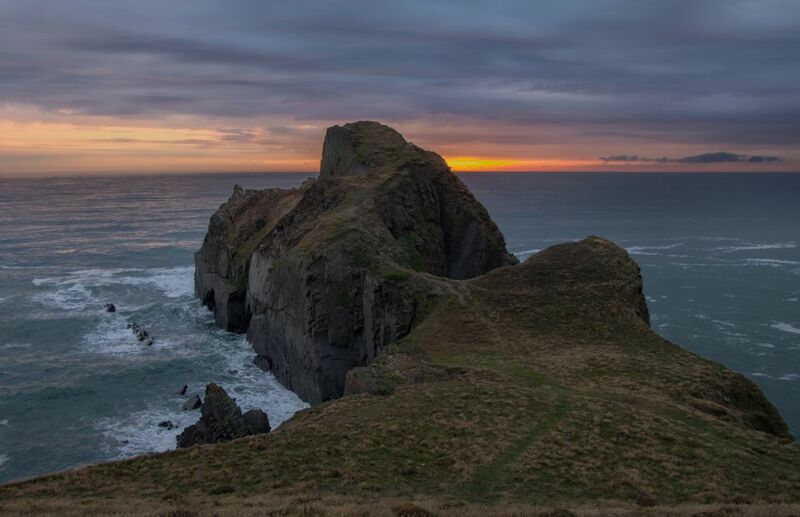 This is a large stitched image rendered in a 1.7 ratio. 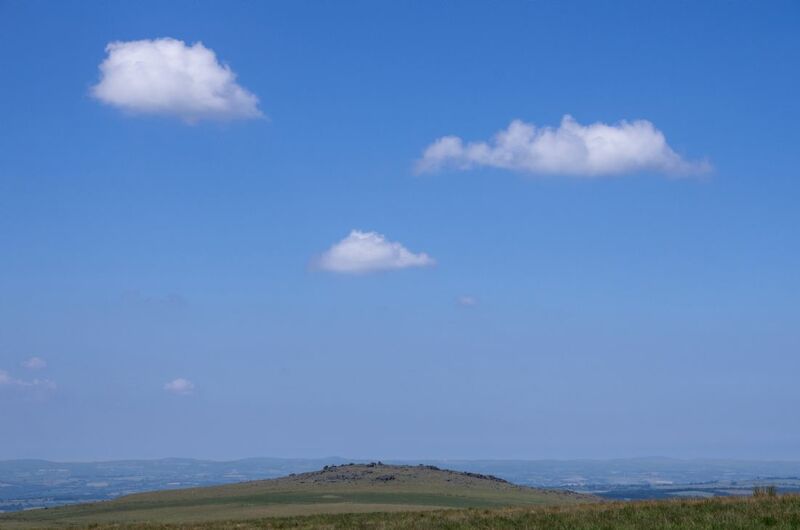 A view from near Honeybag Tor on Dartmoor looking North West over Hamel Down. 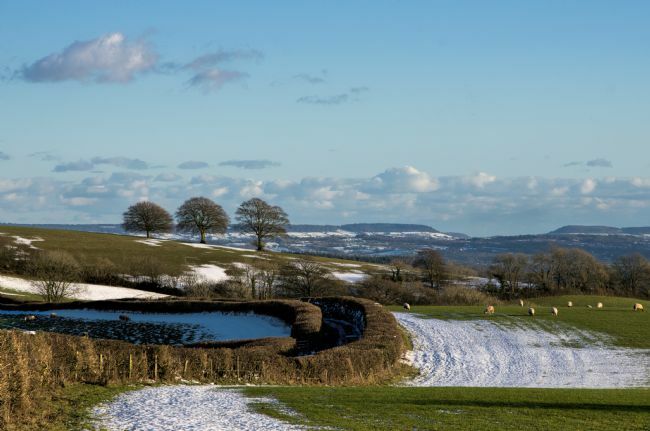 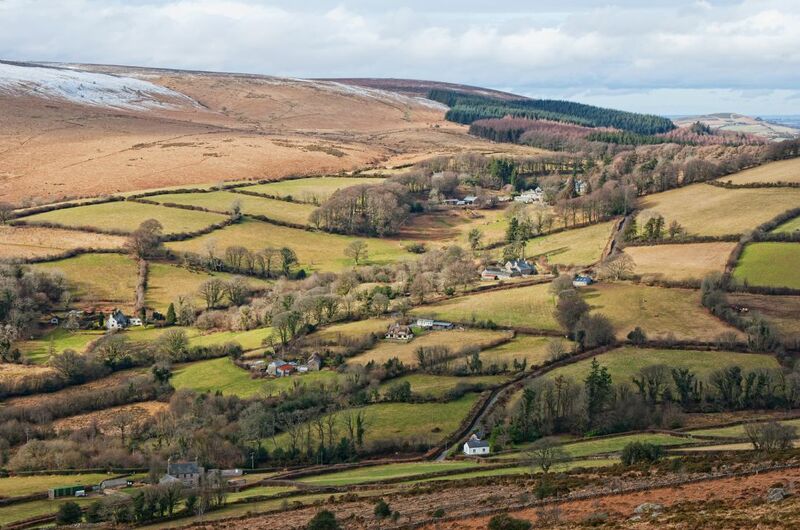 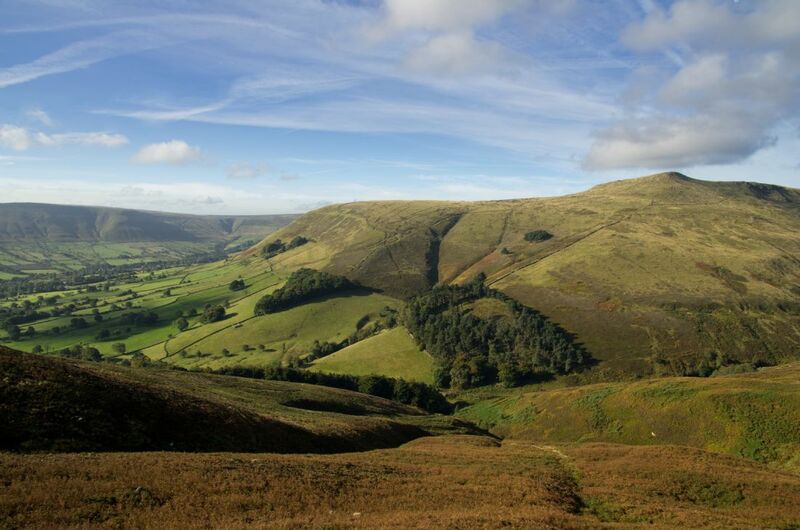 A winter scene with a sprinkle of snow on the tops and the rich browns and greens from the wintered grass. 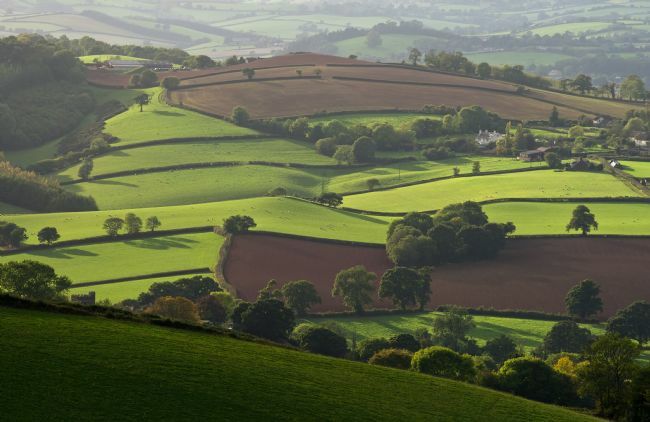 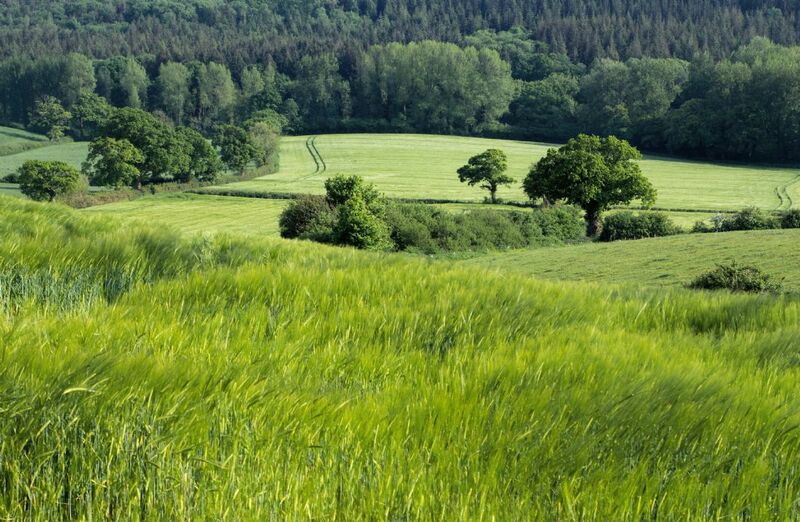 A patch work of fields and settlements giving out to the moor and woods. 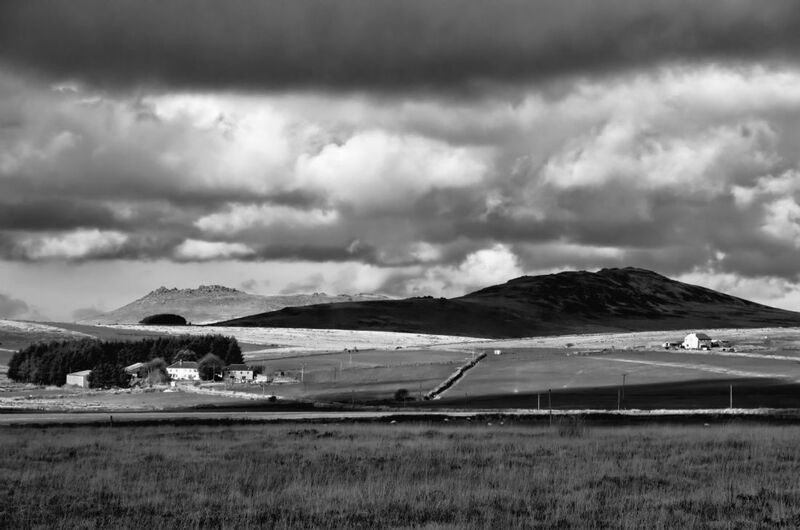 This 2 moors way travels through over this hill. 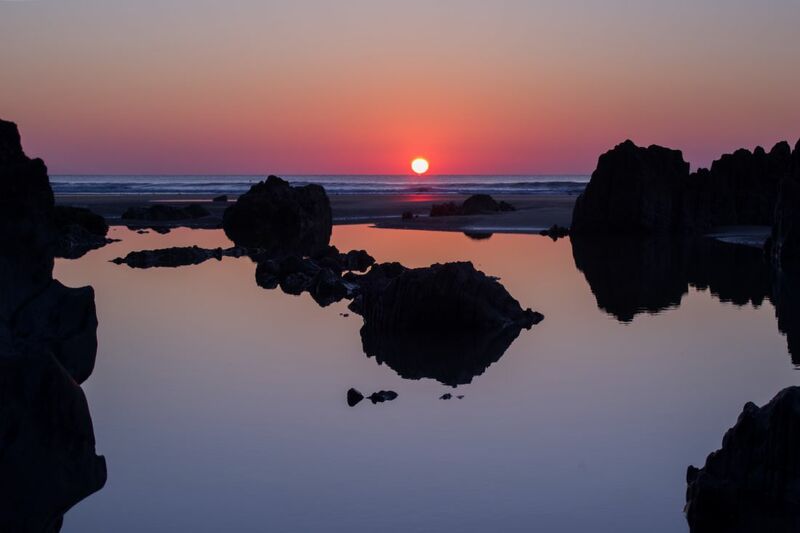 Sunset on Barricane Beach near Woolacombe in North Devon just as the sun meets the horizon. 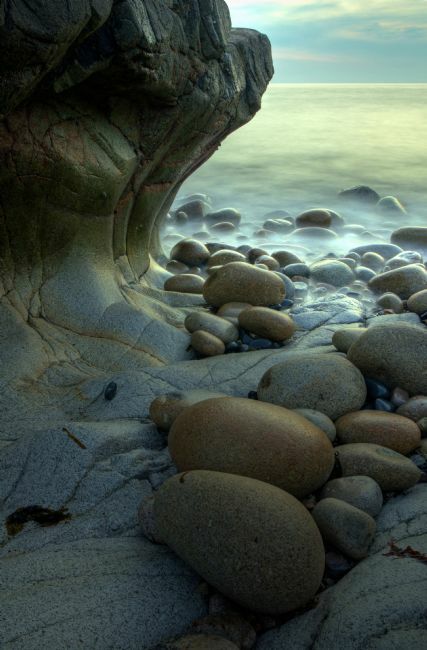 With low tide and a rock pool reflecting the low sun and reflecting the rock on the beach. 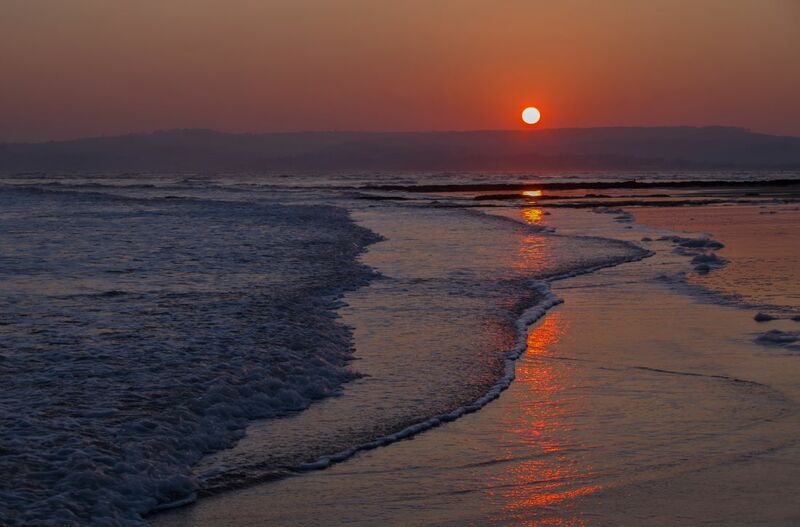 The sun catches the sand between the pool and the surf in the sea.